It was raining when we left Wrightsville Beach at 5:45 a.m. We had made many preparations expecting mosquitos (put up screens), but what actually happened in the middle of the night was that it rained. 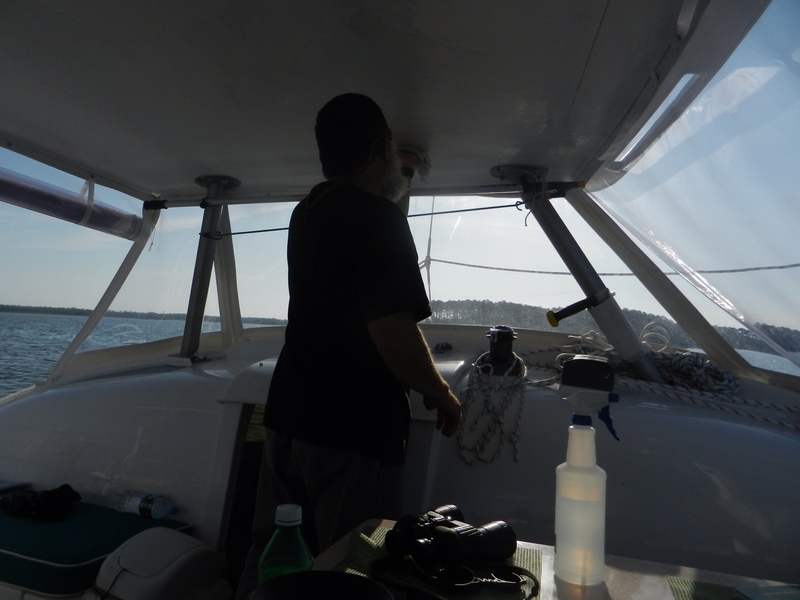 We got up and scrambled to close hatches and eisenglass. Also that morning the aroma from the potty area was getting worse and the leak in the pump would have to be addressed soon. 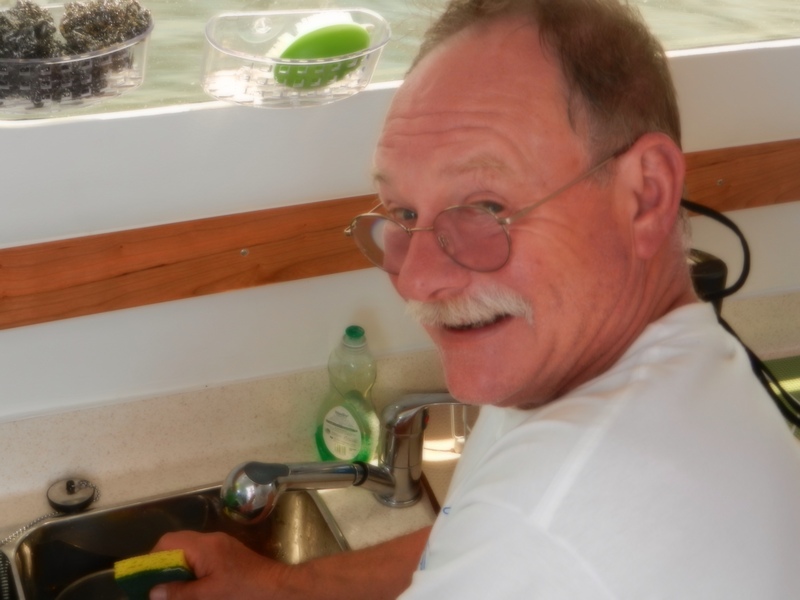 Ralph would have the opportunity to put on his plummer's hat today. By 7 a.m. the sun came out and began to dry things up. 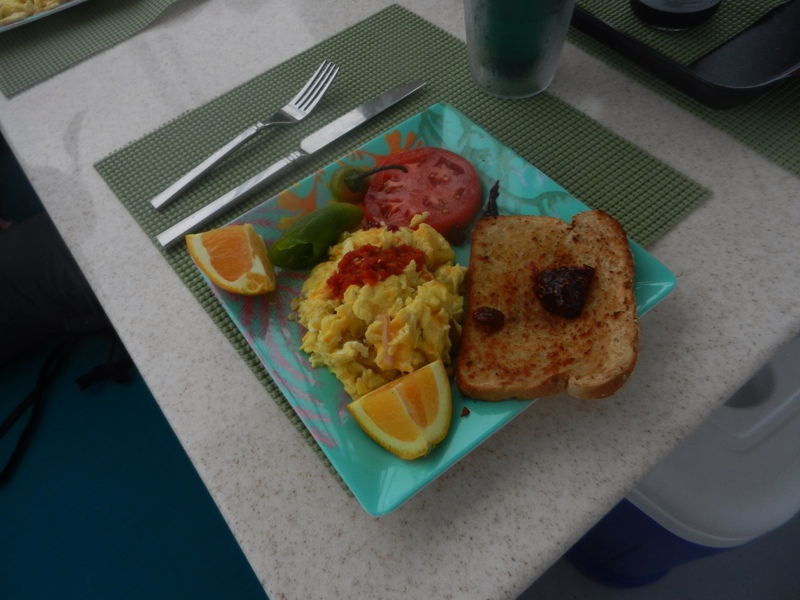 We entered Cape Fear River and began the day with a great breakfast of scrambled eggs and toast with oranges and tomatoes. 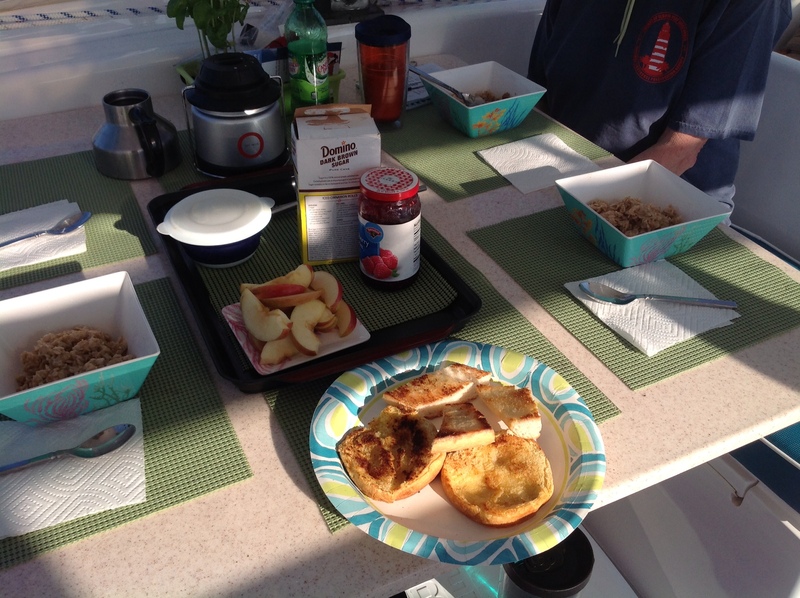 After breakfast Ralph refueled the engines. 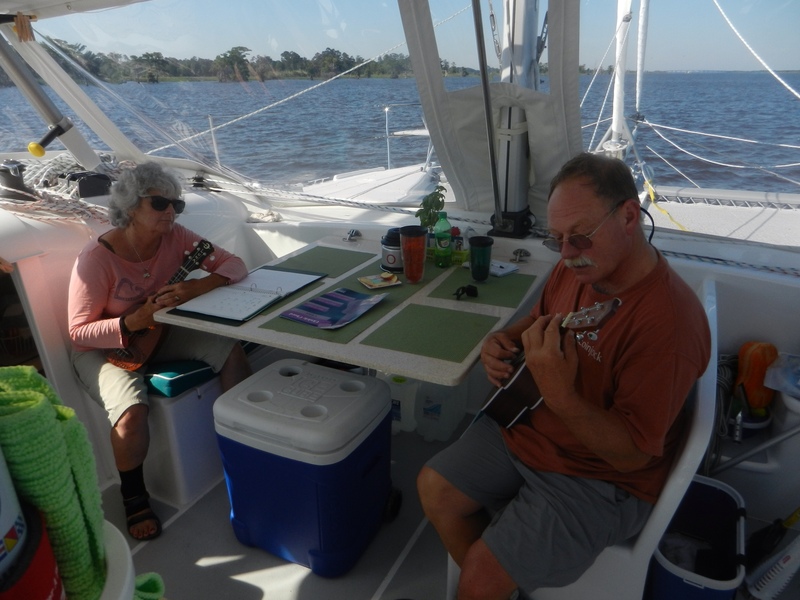 Stephen assisted and Arlene held down the helm. 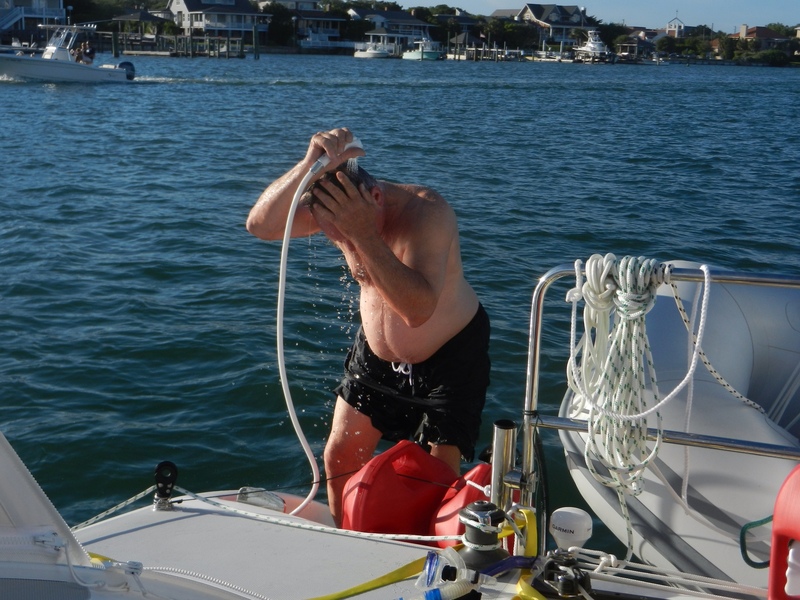 By 9 a.m. Ralph was at work dismantling the leaking pump. 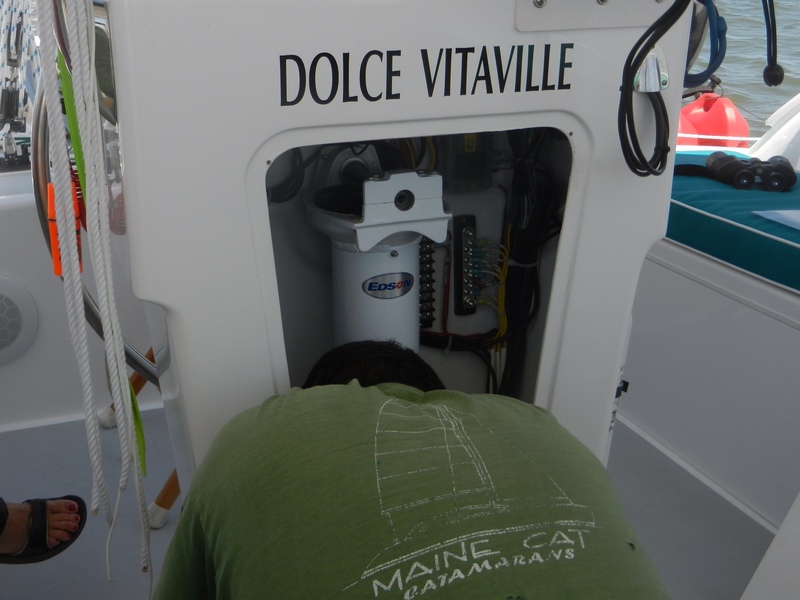 Franci took of the helm and Ralph began work on the leaky pump in head. 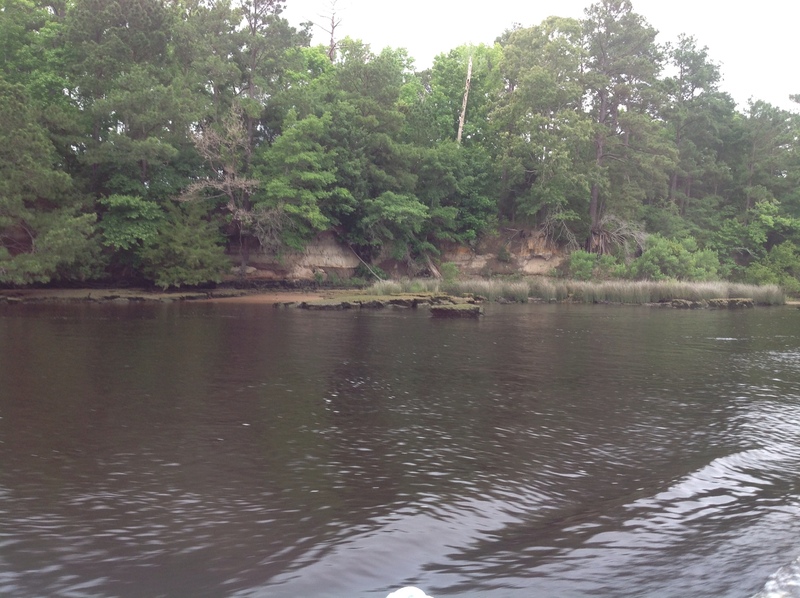 Cape Fear River was a ship channel at this point. 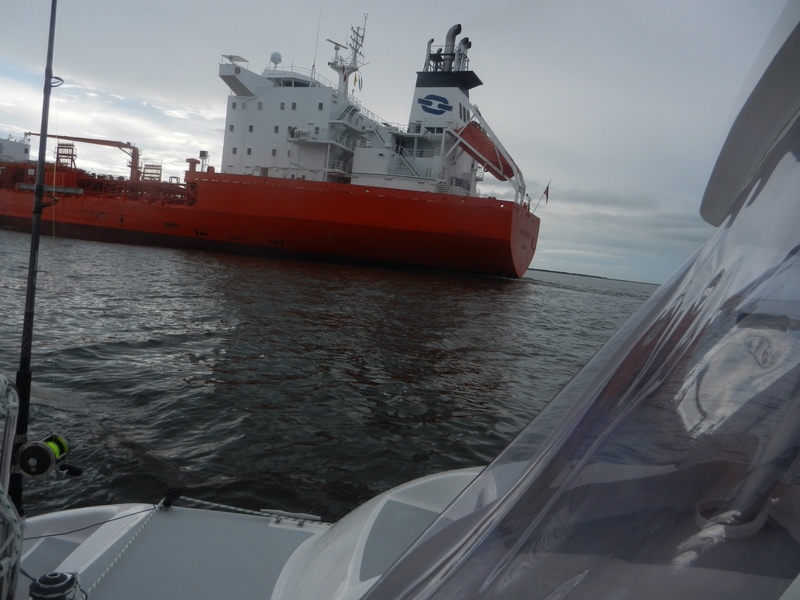 We saw a barge and large tanker. 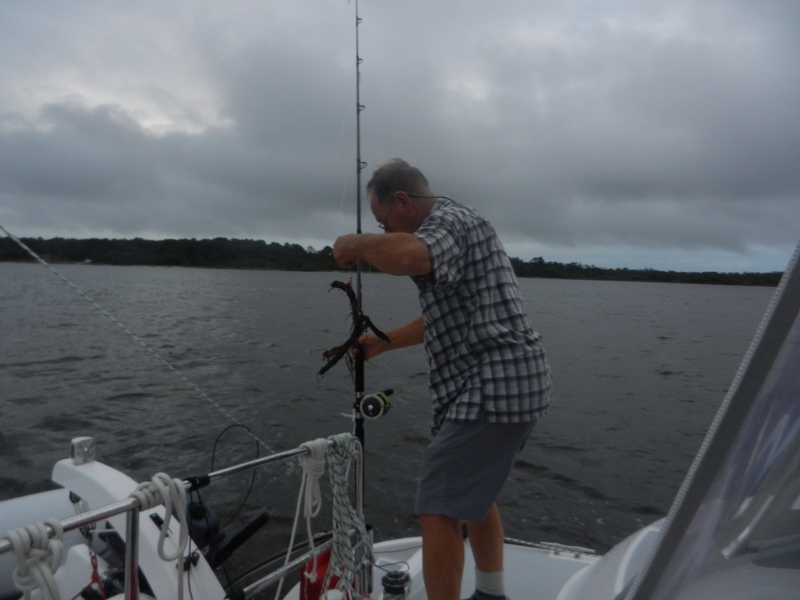 Sttephen got action on his trolling rod…..a stick fish. 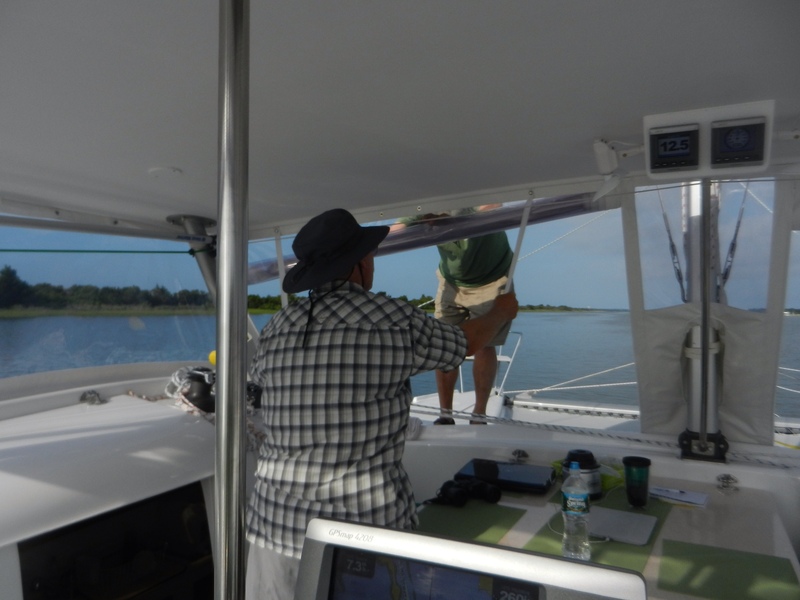 A 9:30 we turned out of the ship channel and into the ICW canal at Southpoint, a very charming community. 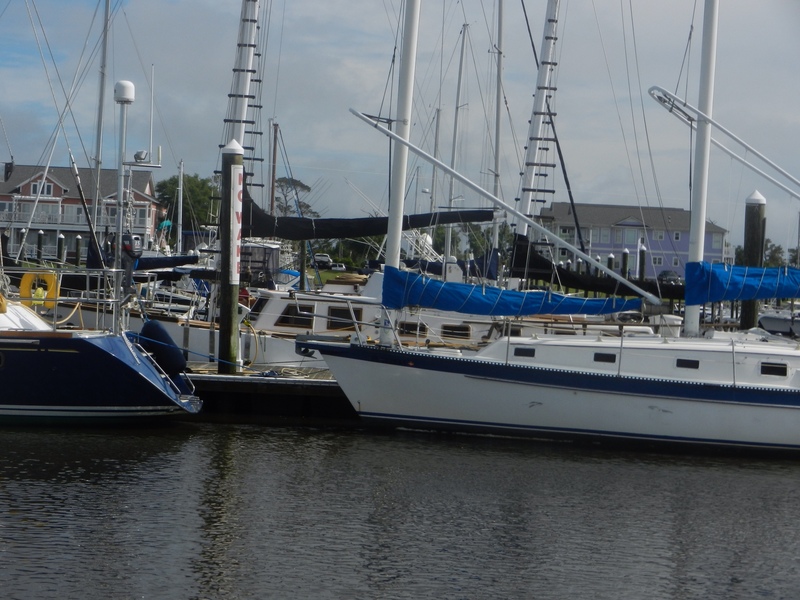 We especially liked Southpoint because they had lots of sailboats in their marina, a relief after having been several days in areas where powerboats rule. 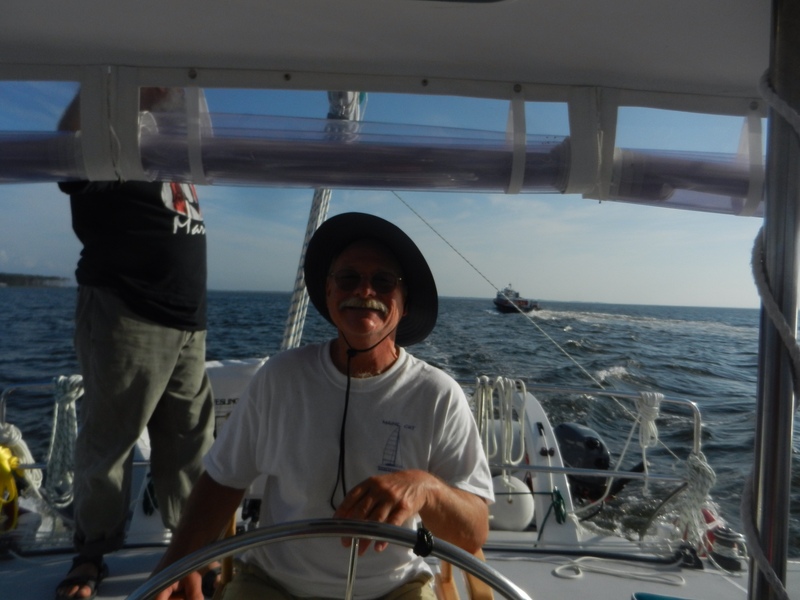 We passed under several new bridges and by another community called St James, once again with plenty of sailboats. 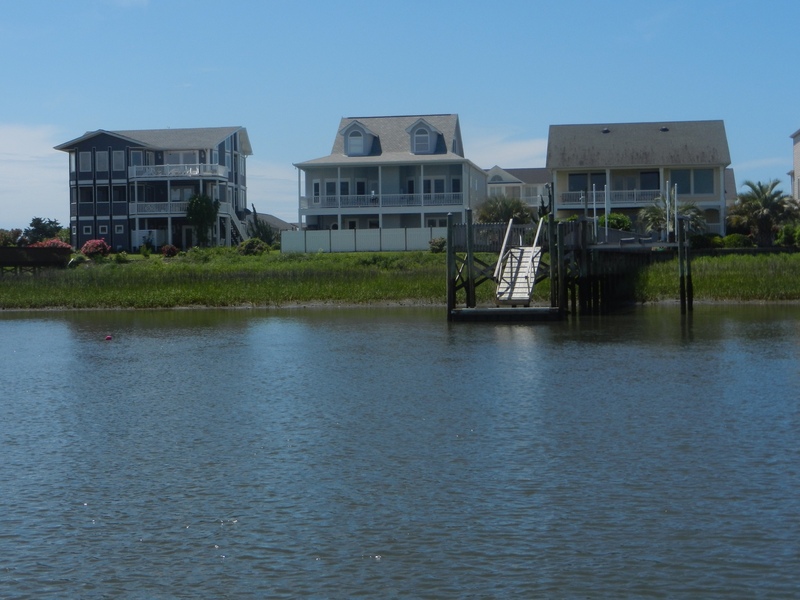 There were still plenty of homes with private docks along the canal, but they were not as opulent as in the Wrightsville Beach area. 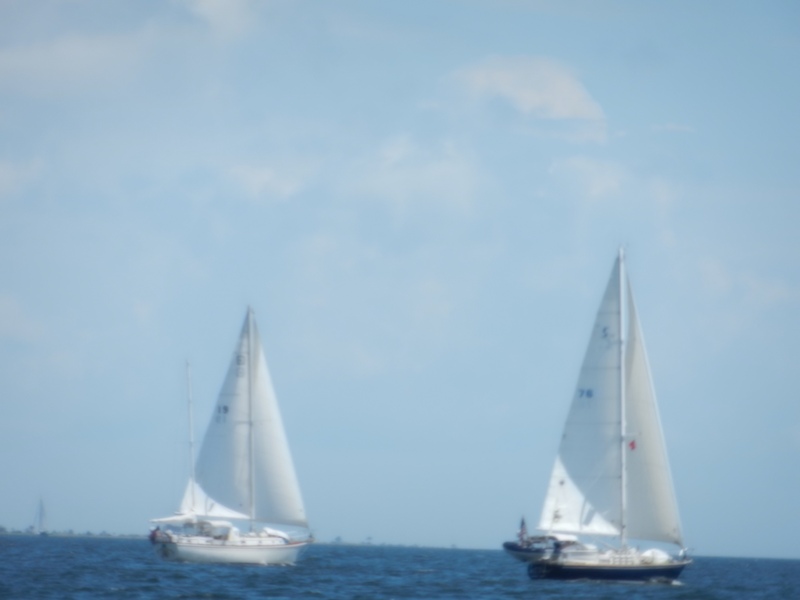 We were delighted to see sailboats again after several days in areas where powerboats rule. 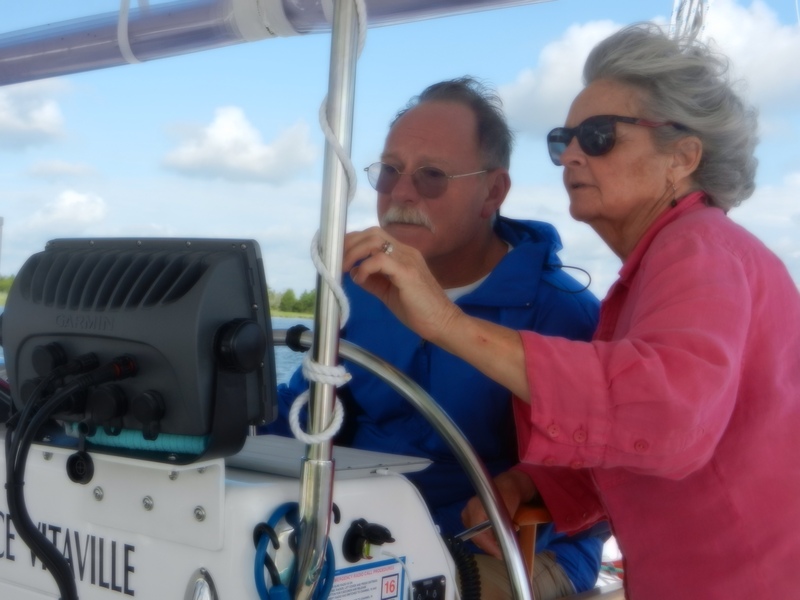 By 11 a.m, Stephen took over the helm, Arlene was still helping to navigate. She makes a wonderful assistant. 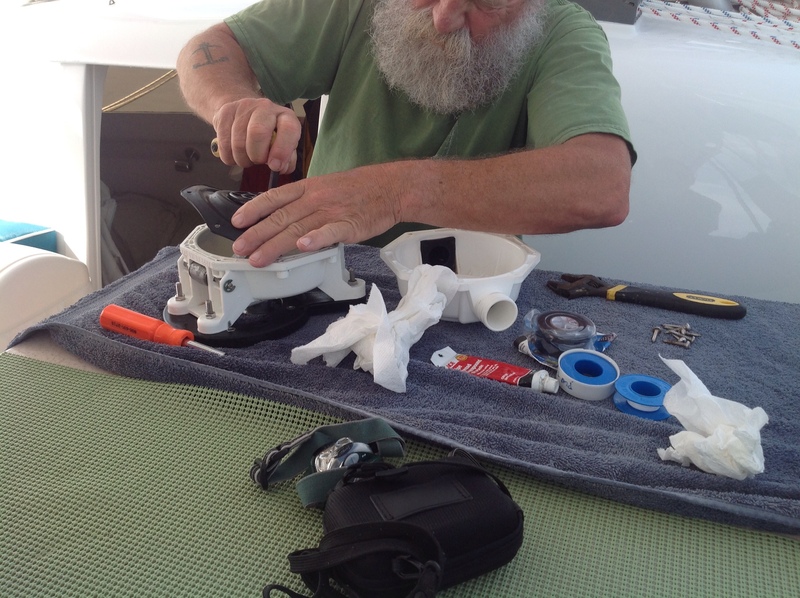 Ralph was still busy at work, by this time trying to reinstall the potty pump. He found this to be the most difficult part and he wrestled with this until noon when he finally reinstalled it in a slightly different angle. The good news was, however, that it worked. We had a head again. Thank you, Ralph. Stephen got in a little computer time. 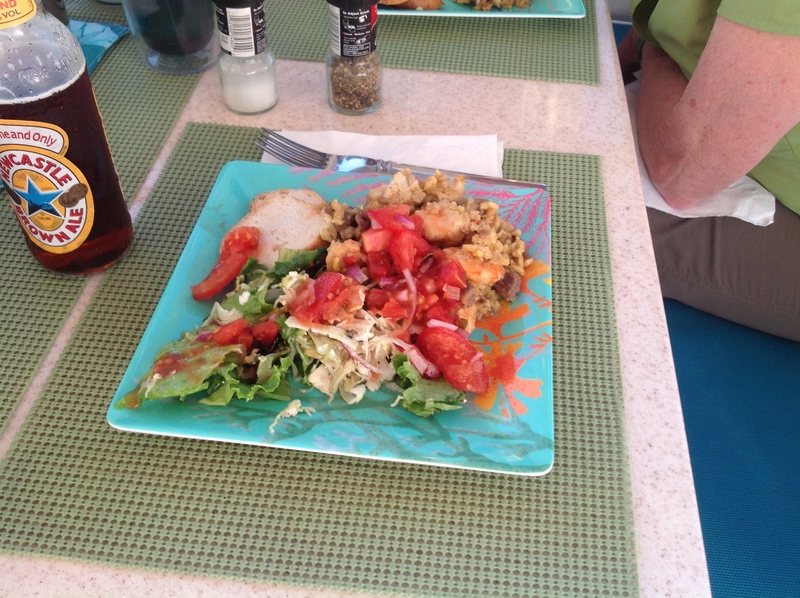 By then it was time for lunch…..deli style sandwiches with everything we could find in them. 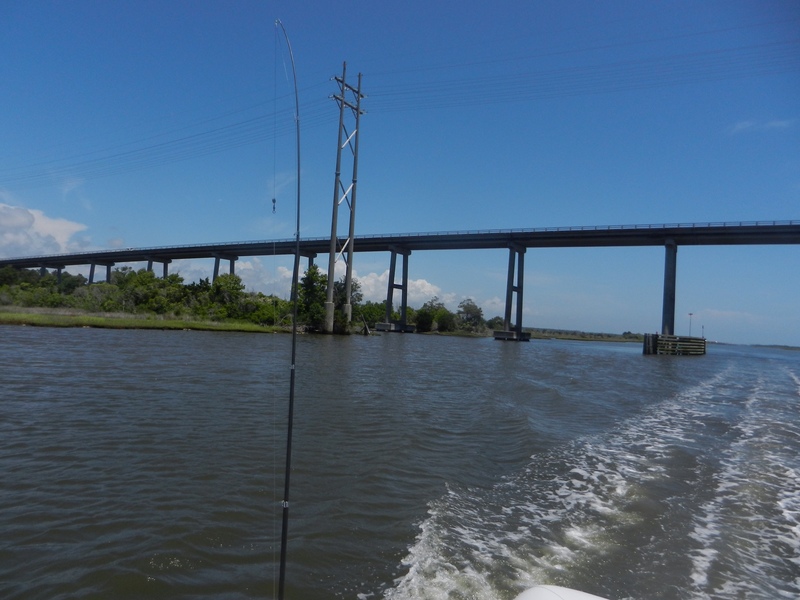 We passed under the Holden Beach Bridge. 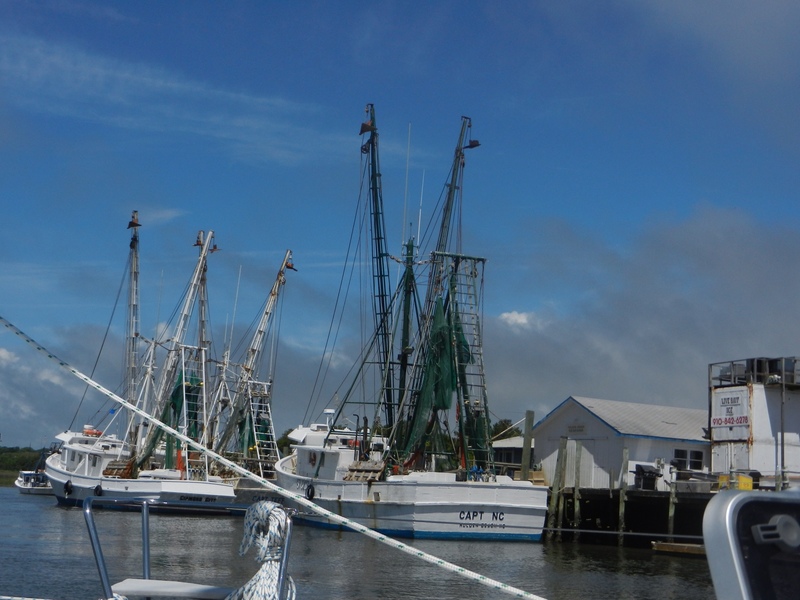 We saw shrimp boats and a seafood restaurant at the Holden Beach Marina. This one's a fixer upper for sure. 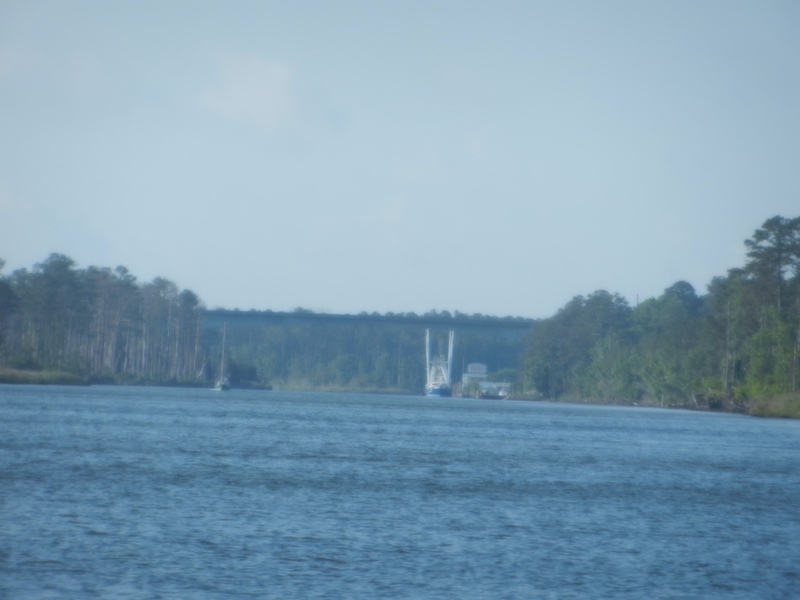 Soon we were at Little River where we left North Carolina behind. 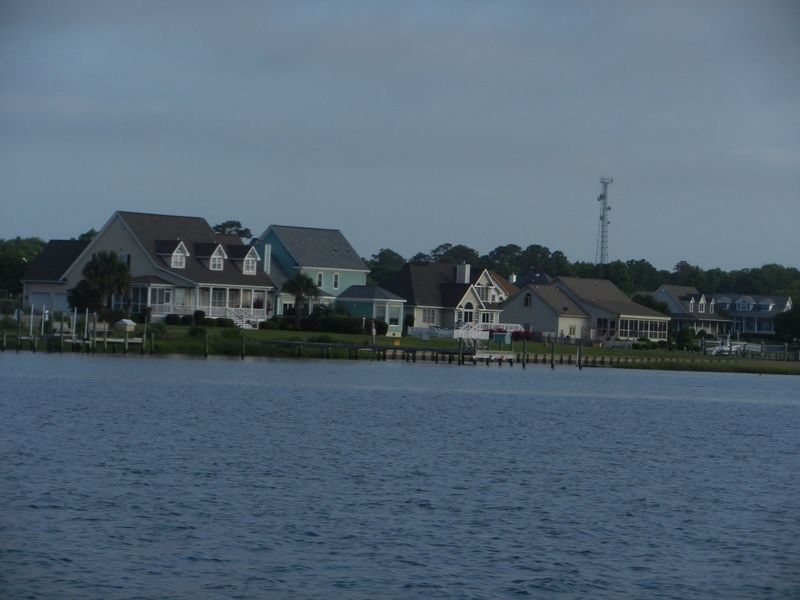 We were still seeing lots of houses and private docks along the way. 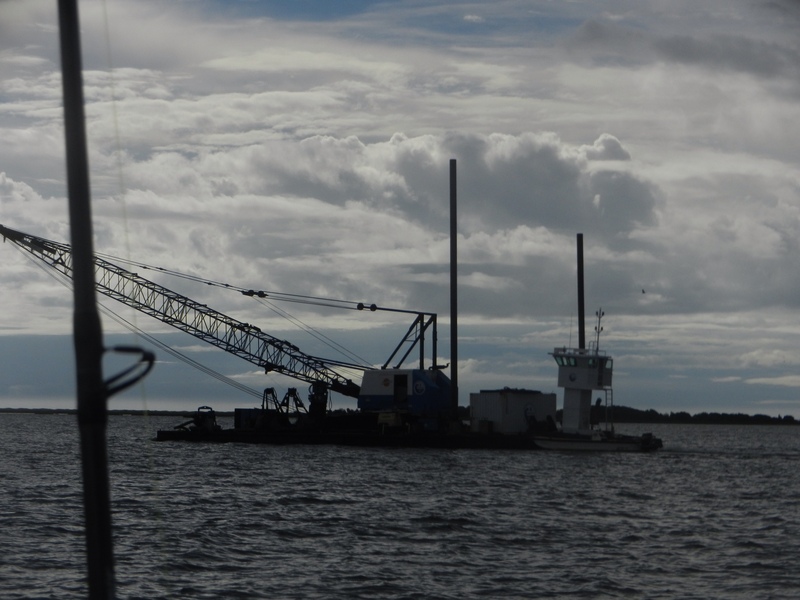 We saw several under construction and were impressed with how solid they are built. The are all solid plywood underneath, made to withstand hurricanes no doubt. 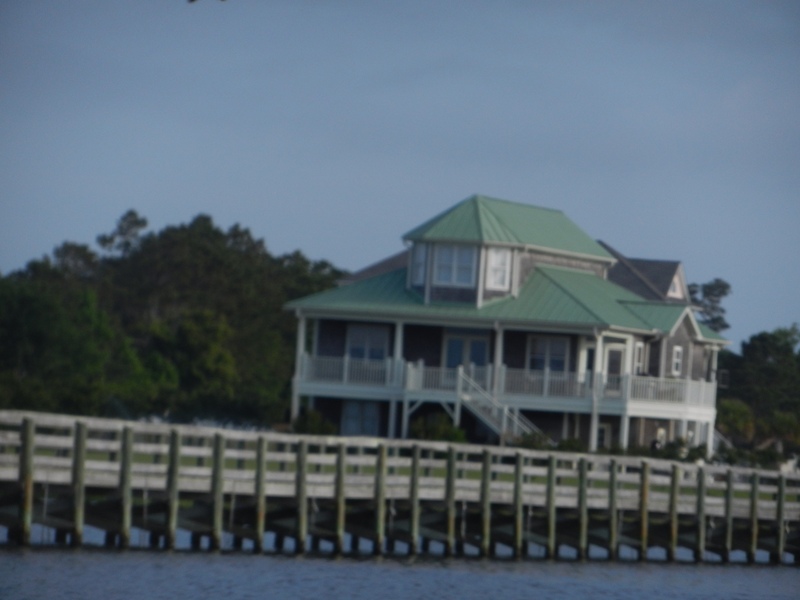 Three story houses are the most common, with the first floor probably being used as a buffer for storm surges. 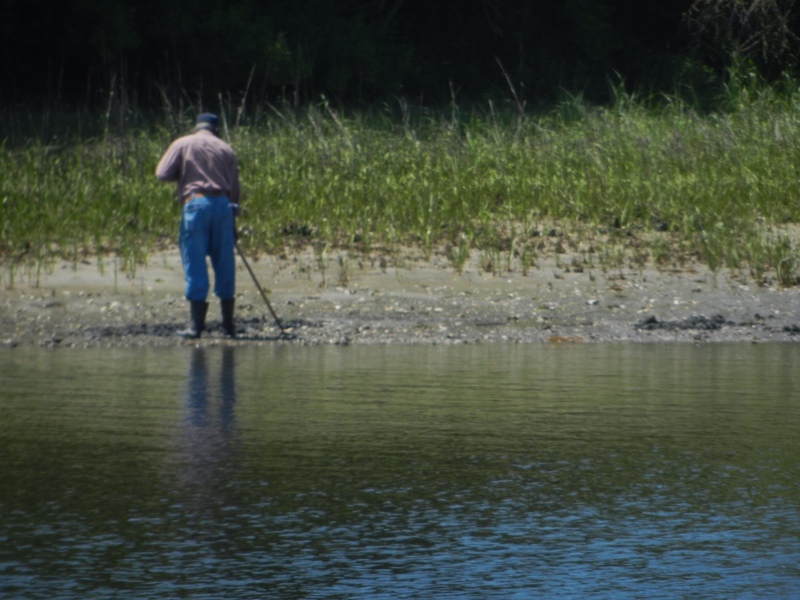 We're not sure what these guys are catching along the banks. In the afternoon the scenery would change a little. 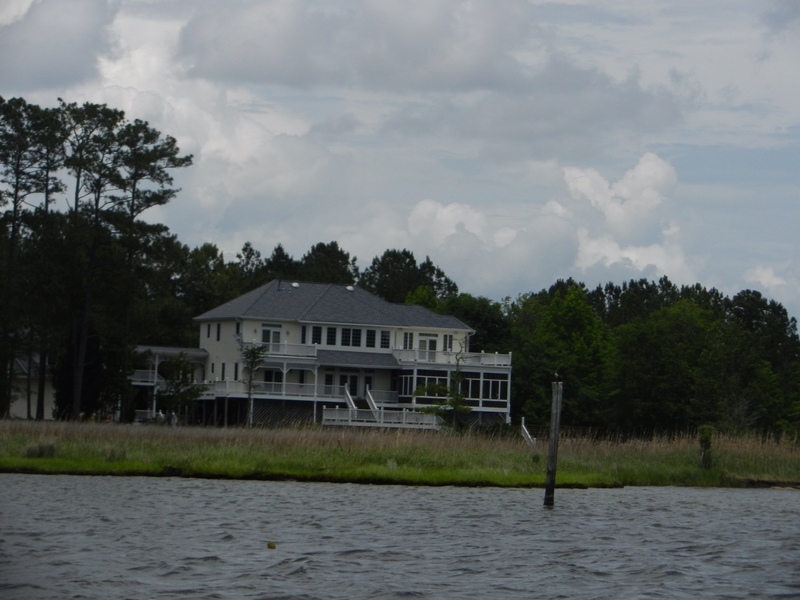 There were fewer houses along the canal and we began to see shores covered in shells and shores with rocks. 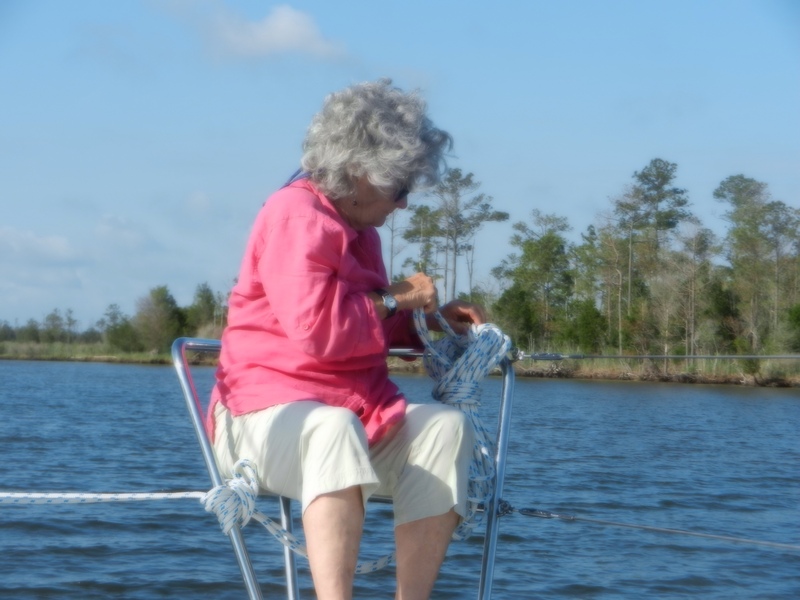 Arlene called this a boatel. About 3 o'clock it began to rain again. 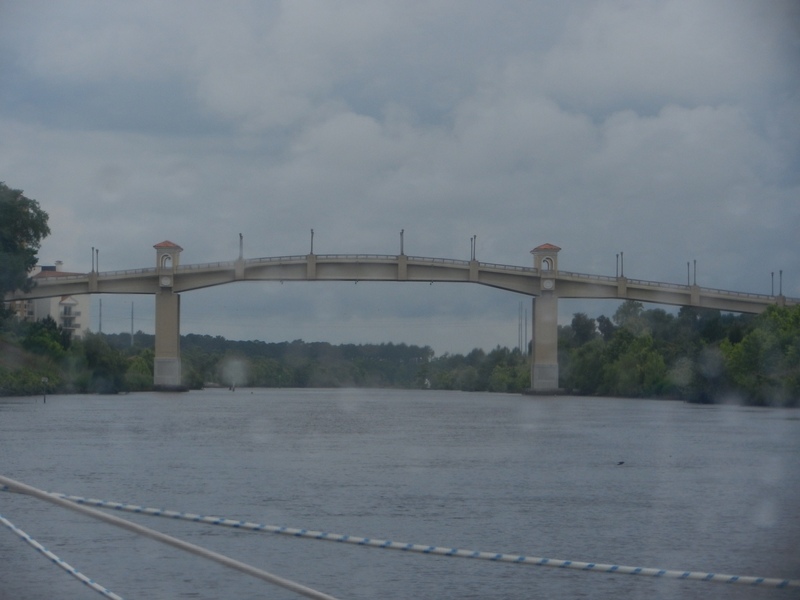 It was still raining when we passed under the Barefoot Landing Bridge. 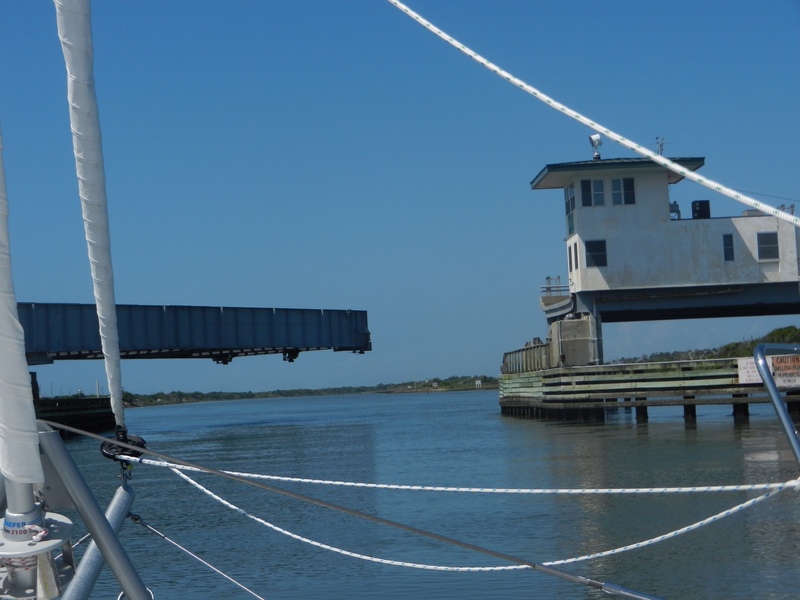 This was once again a swing bridge but they opened for us upon request, no need to wait. 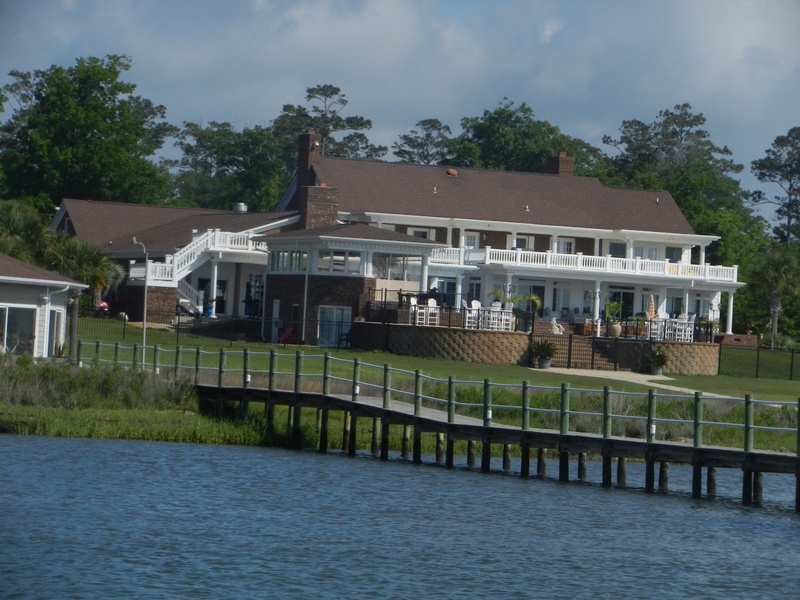 Barefoot Landing is a tourist community that caters to golfers. They have a number of large hotels, at least a dozen golf courses and an area called the Golden Strand with numerous restaurants, bars, stores and live music. By 5:30 we were racing to make the 6:15 opening if the Socasbe Bridge. 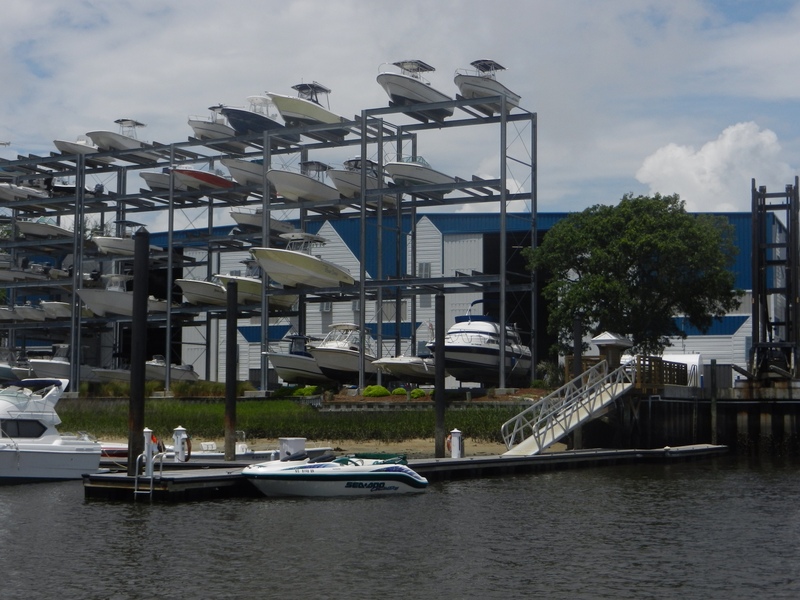 After that it was only 20 minutes to our final destination, the Osprey Marina. 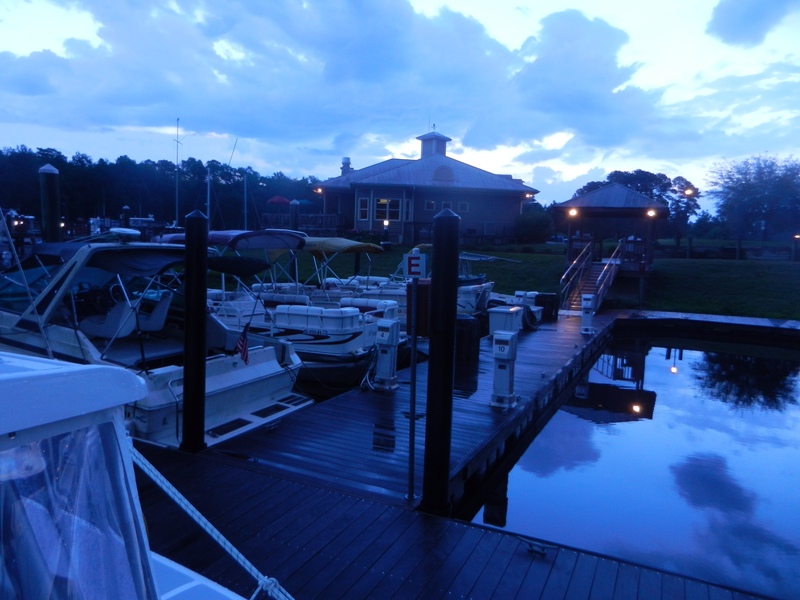 The Osprey Marina is a charming little marina, once again a place that Ralph knew about. He has stayed there many times. 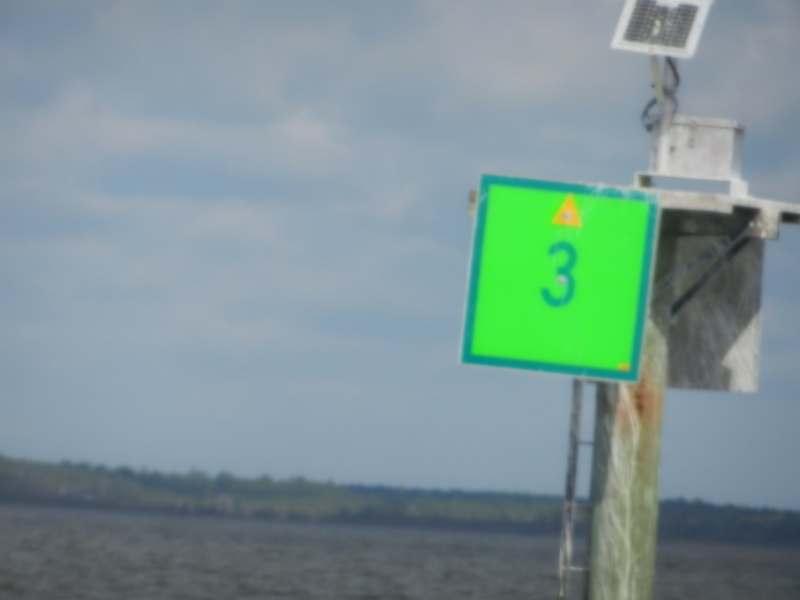 Although in the guides it says that they do not have transient docks, Ralph called ahead and and they found a spot for us at the end of one if their docks. It was pouring down rain as we docked. They were very welcoming and gave us a little goody bag with crackers, jelly, sweet rolls, pens and note paper, a keychain and a little packet with shampoo, lotion and handy wipes. Their showers had marvelous water pressure, the best shower we've experienced in years. 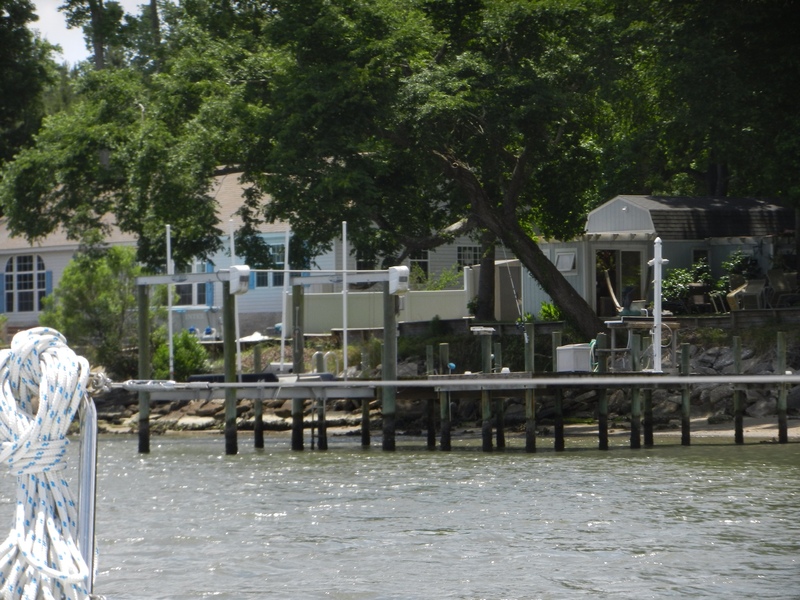 There were two garbage cans on every dock, very convenient. 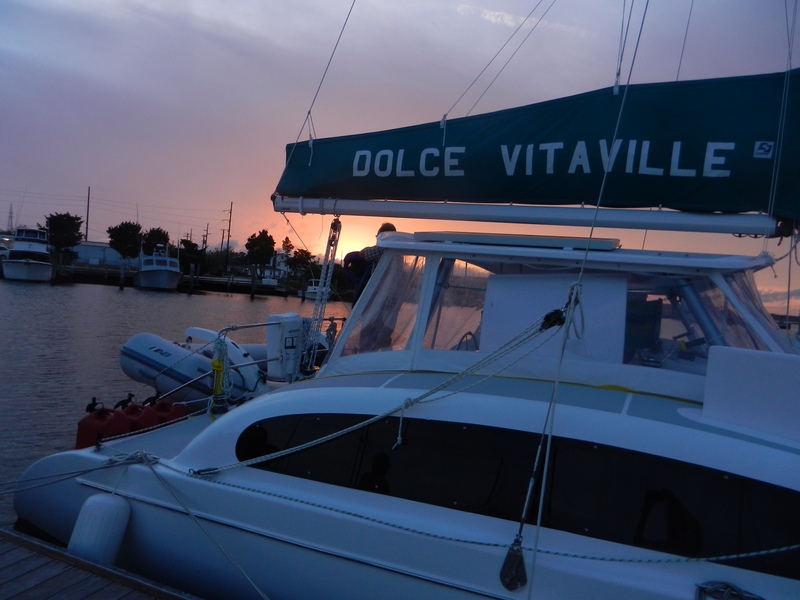 There's even a nearby Italian Restaurant that will come pick you up and return you to your boat after dinner. 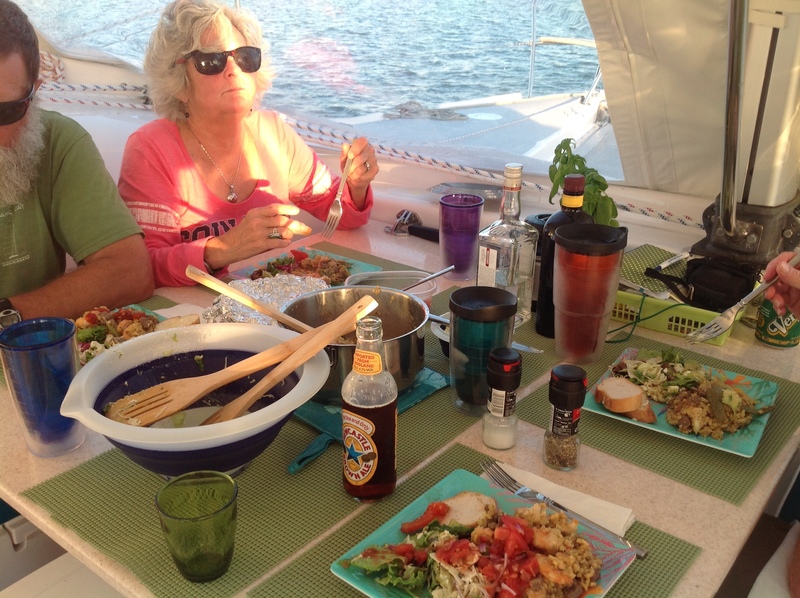 This night we chose to have our own Italian dinner on the boat. 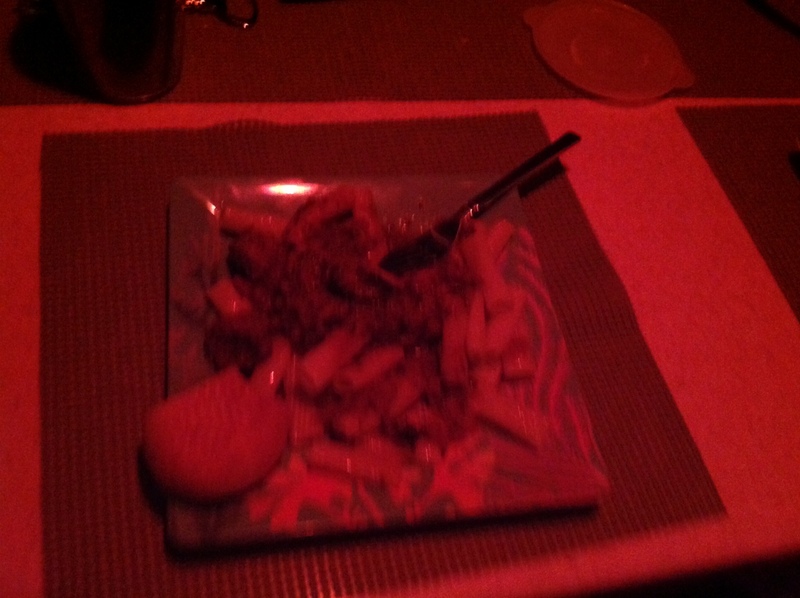 Arlene had already cooked us Italian sausage with tomato and pesto sauce, zuchinis and mushrooms served over noodles. It was delicious and we got to adorn it with parmesan cheese and some leaves from our pet basil plant. In the morning there was a beautiful sunrise. Things would soon dry up. Stephen tried a little fishing. 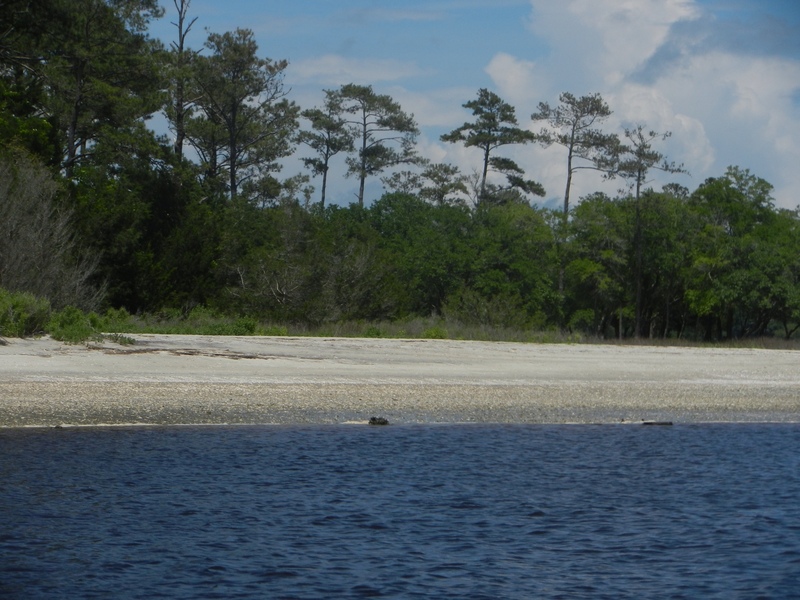 The Maccamaw River was deserted and peaceful. We felt like we might see Hiawatha pull up in a canoe at any moment. Ralph tried one more idea for improving the potty repair. 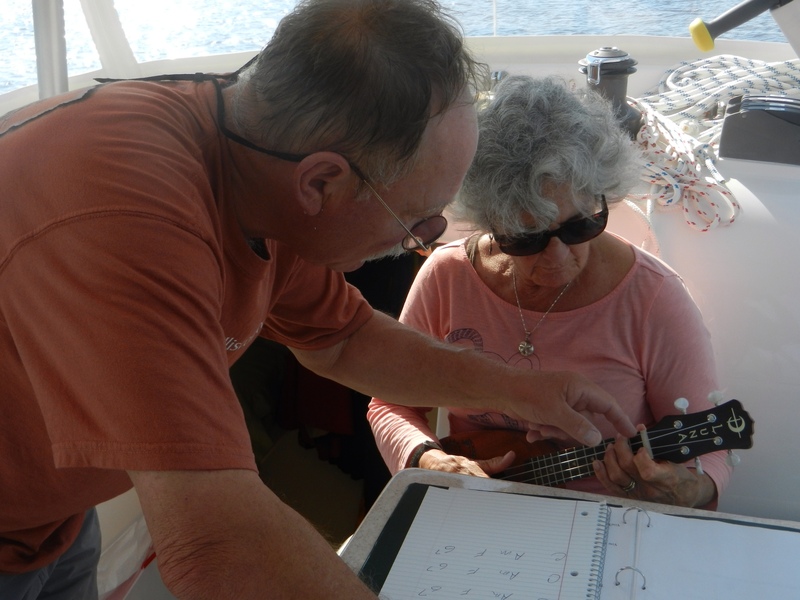 After a great oatmeal breakfast Stephen gave Arlene a few pointers on ukelele. 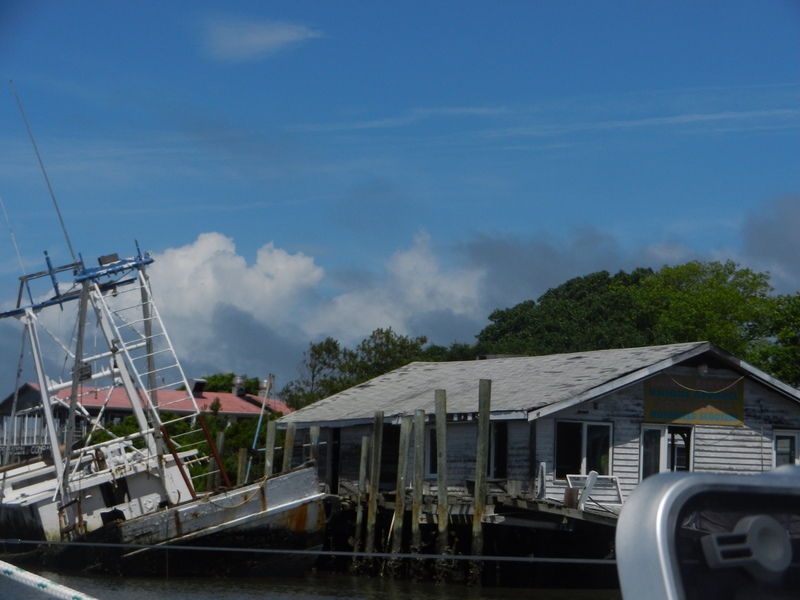 We were on our way to Georgetown, SC to get fuel, ice and any supplies we might want for the next couple of days. 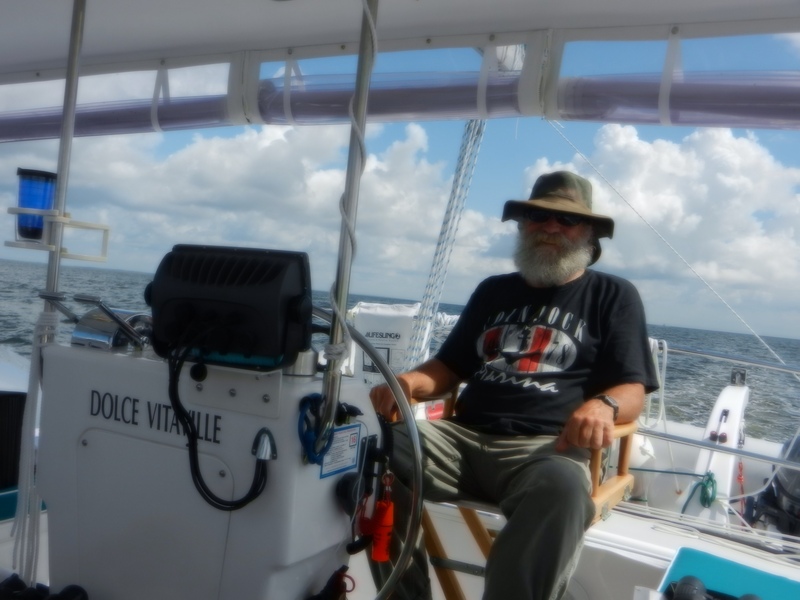 After that, back into the Atlantic Ocean for a couple of days of sailing hopefully. 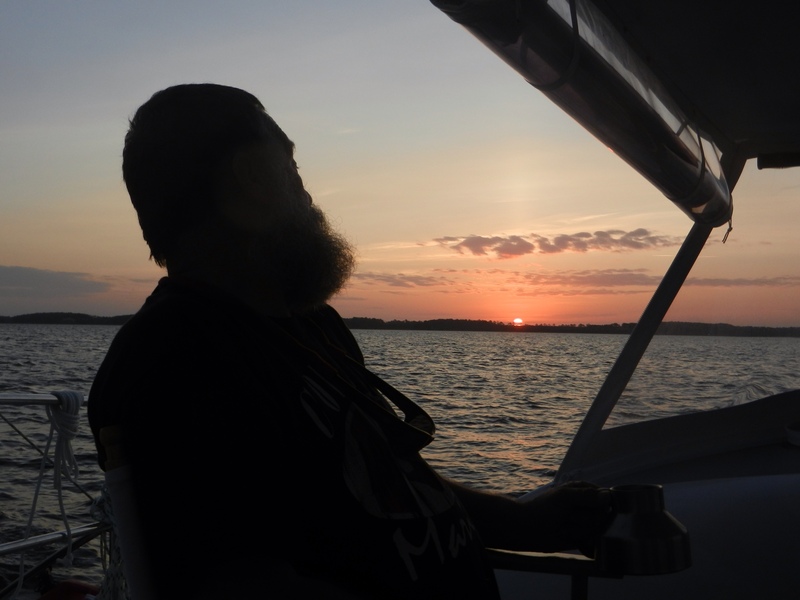 In a couple of days we will be somewhere in Florida. Hooray. 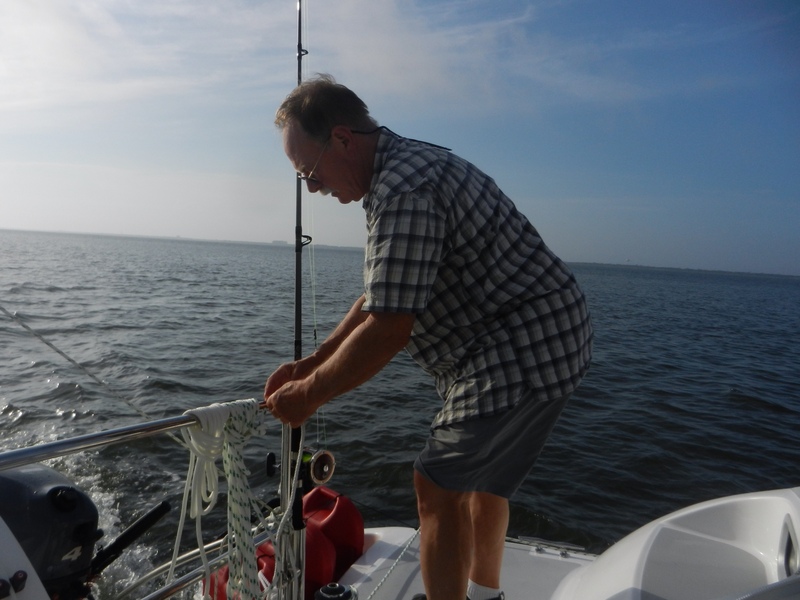 We left Morehead City at 6 a.m. Stephen was excited about trying to catch a fish. 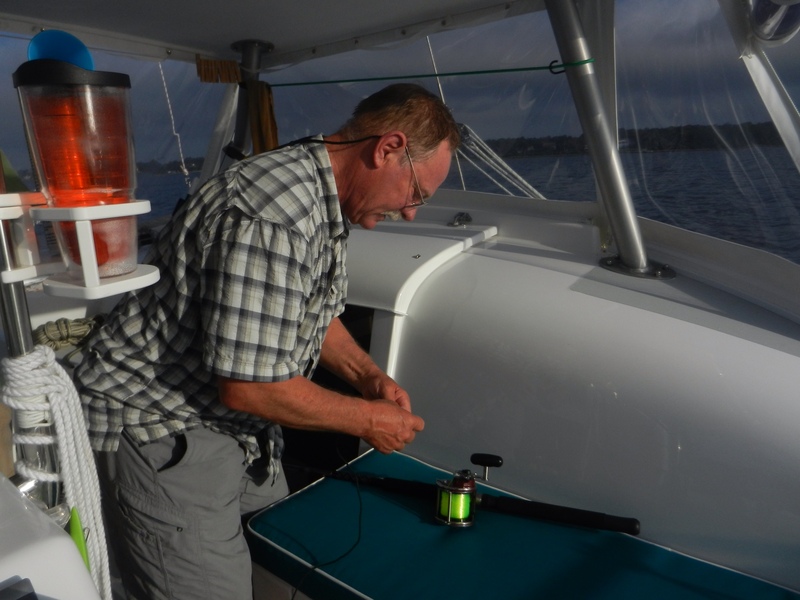 He went online and got the appropriate fishing license and had fun putting together this new gear. 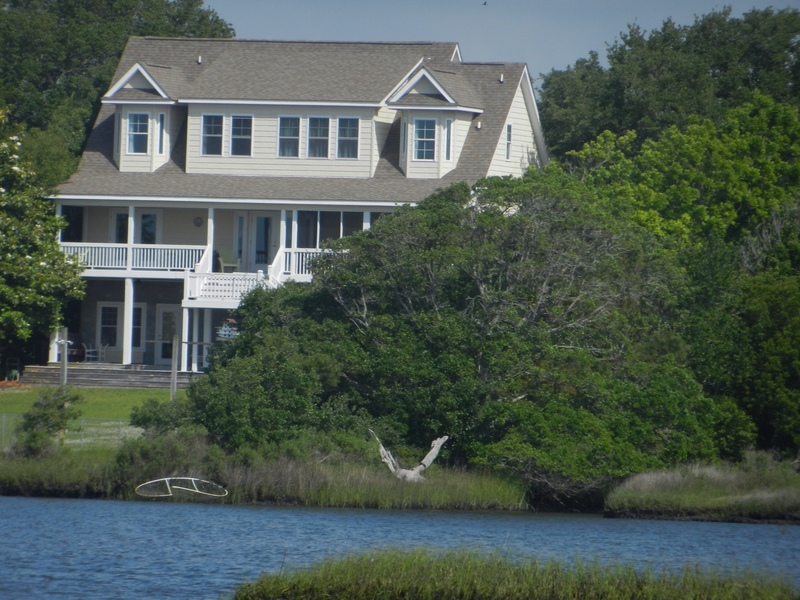 We spent the day traveling south in the ICW right along the coastline. 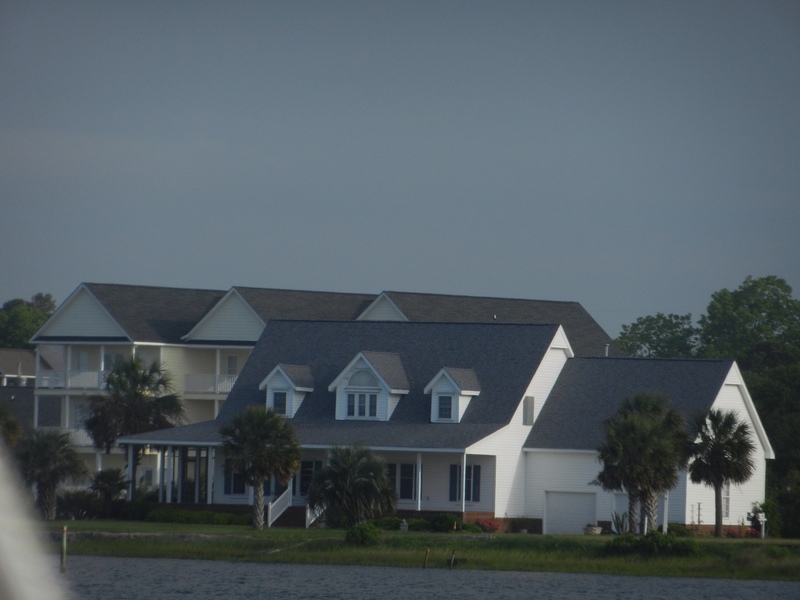 On the mainland side of the ICW were lots of private homes, some of them quite large and with very nice private docks. 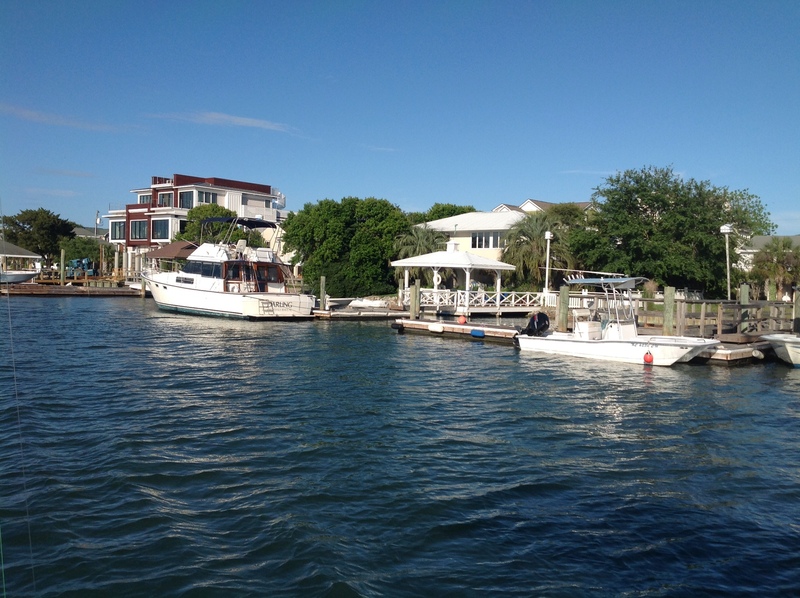 On the barrier islands side were hotels and condominiums. 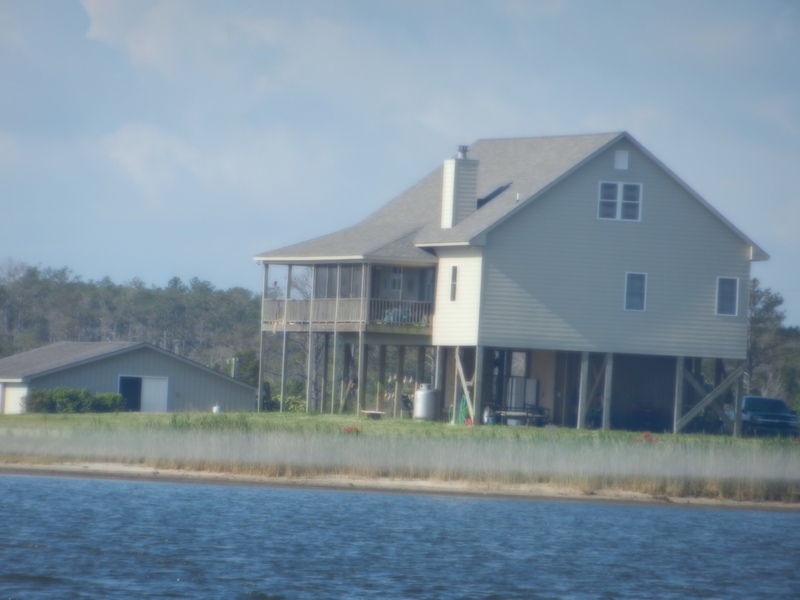 Many of these homes were vacation homes. It makes one wonder what their real homes look like. We started to call it the Parade of Homes. 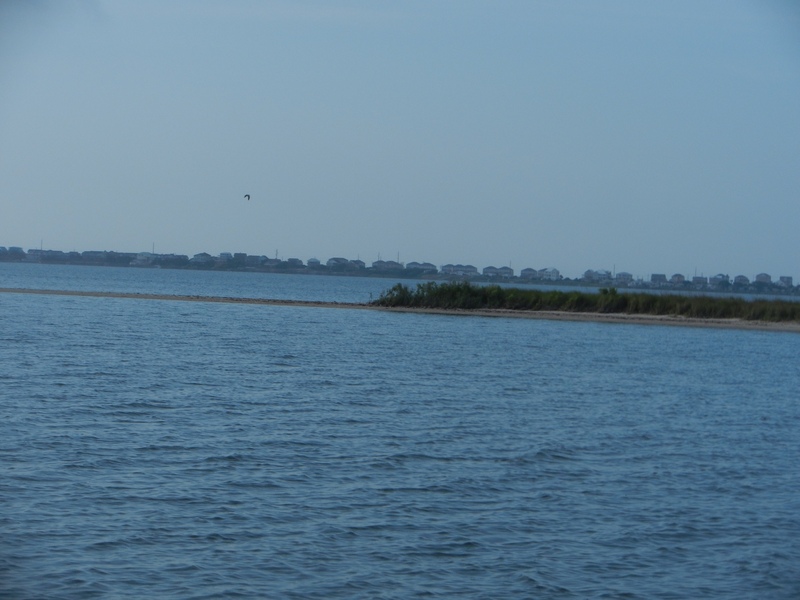 These little islands were created when they dredged the channel. Stephen and Ralph roll up the eisenglass to let the breeze flow through. Ralph made his final fix to the steering linkage. He replaced the hose clamp with a stainless steel one. 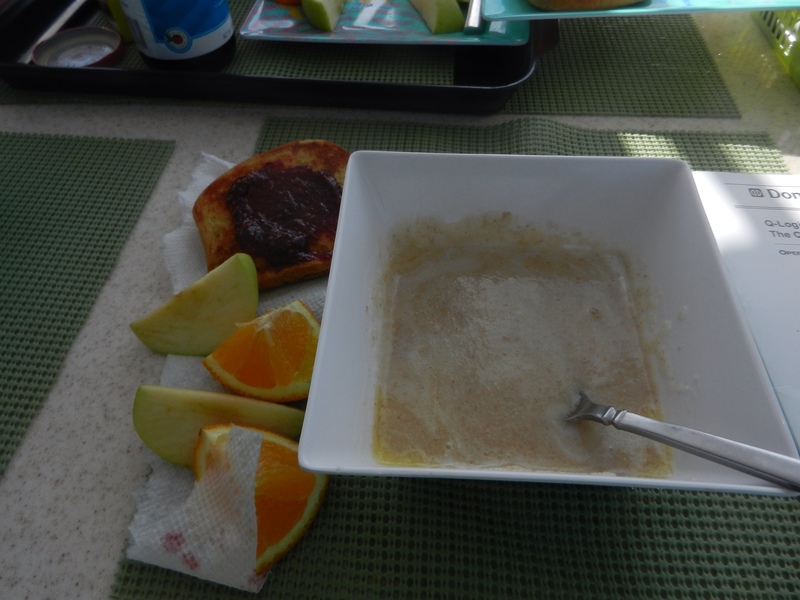 About mid morning we had a hearty breakfast with cream of wheat, fruit and toast. 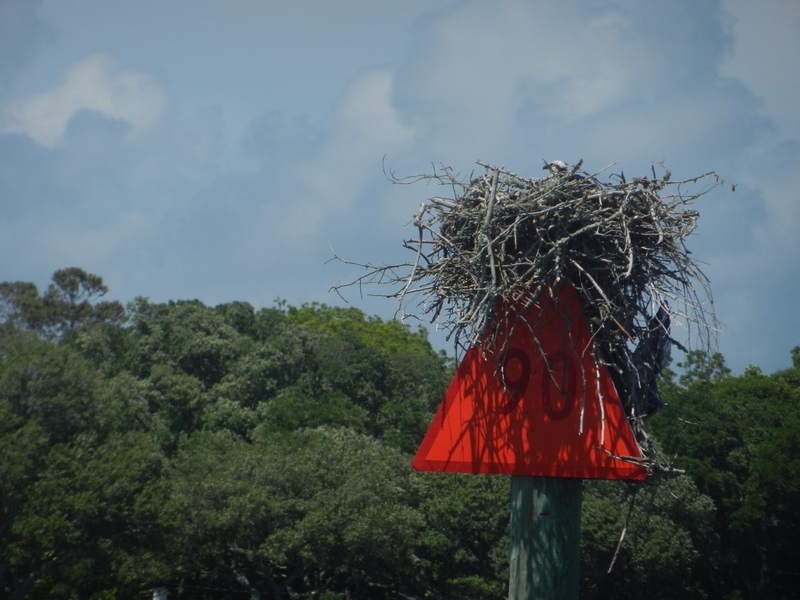 We saw lots of osprey nests in the channel markers. 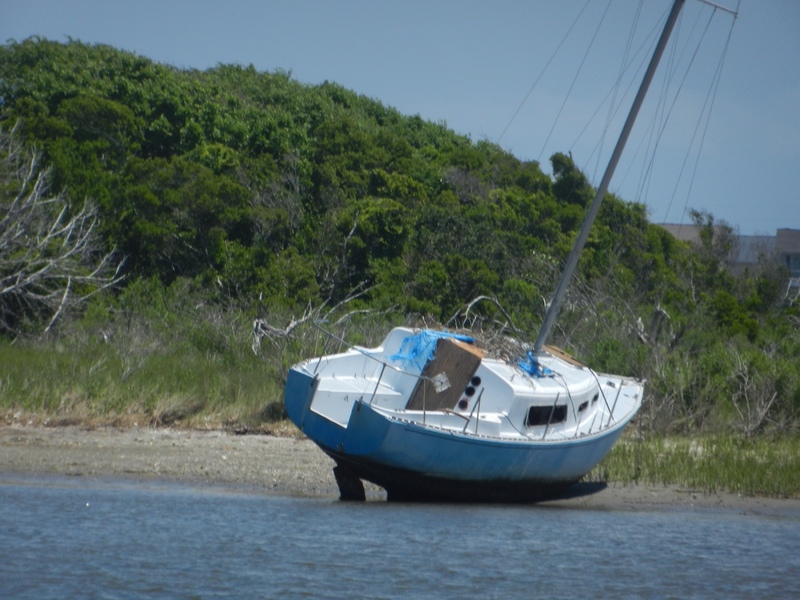 We saw a deserted boat. The parade of homes continued throughout the day. 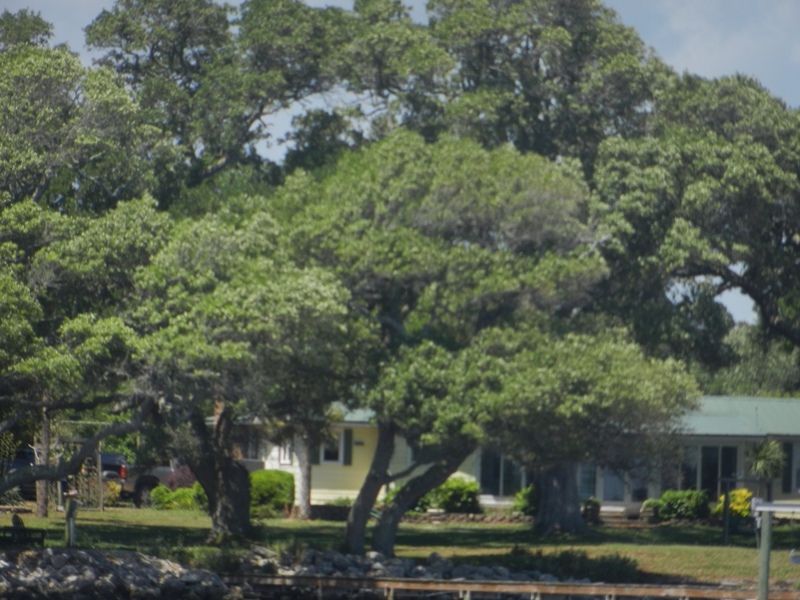 Some homes had beautiful trees. 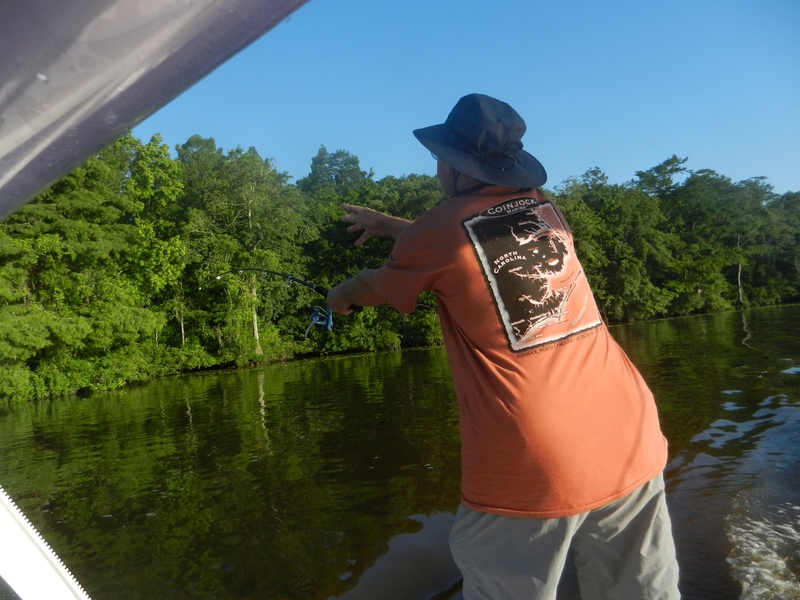 The fishing went on throughout the day. We waited on several bridges that day. At 11a.m. 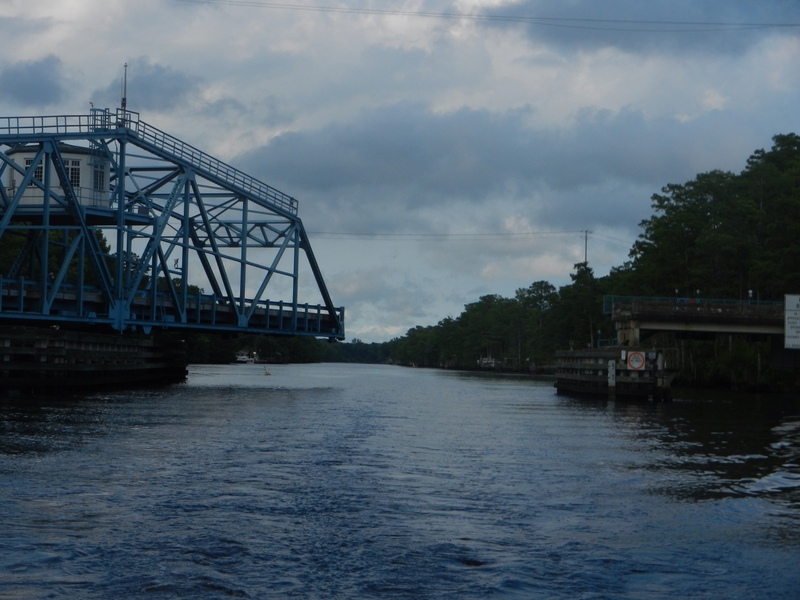 we waited for the Onslow Bridge, a swing bridge. 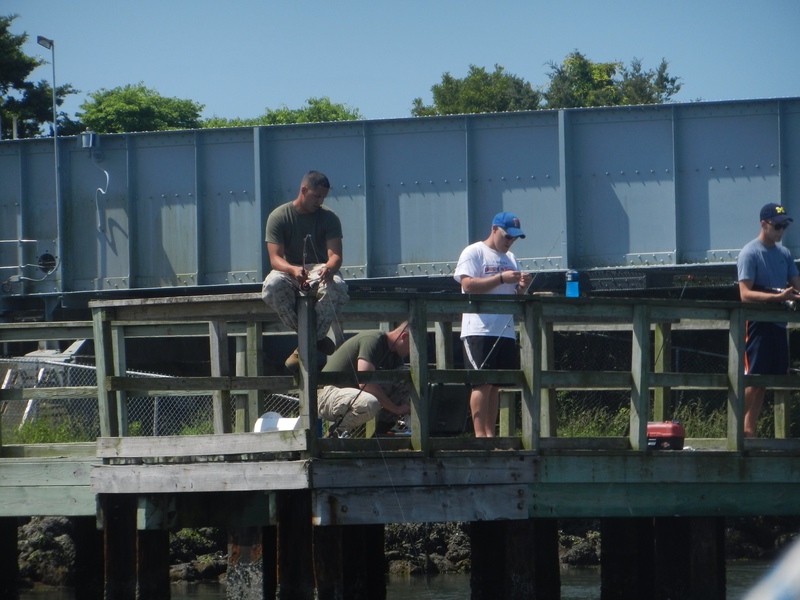 There were a number of folks fishing there. 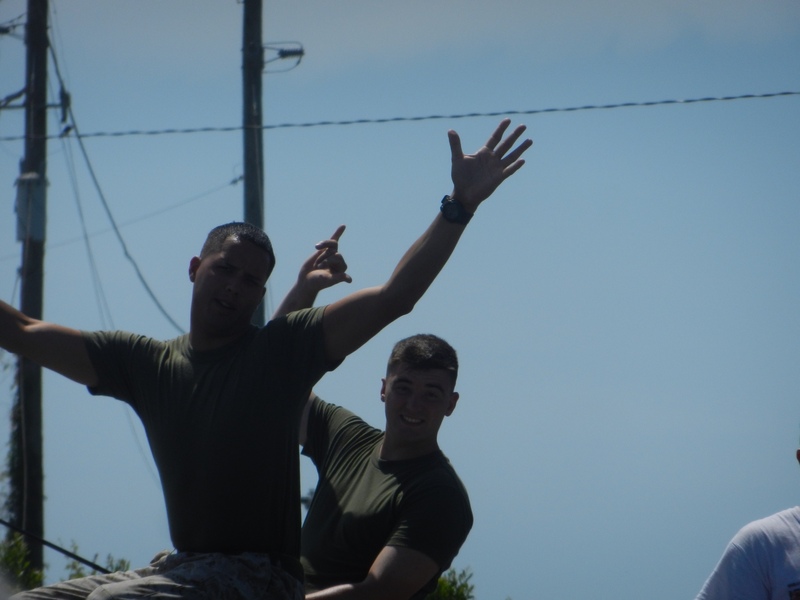 We were not far past Camp Lejeune, note the military guys. 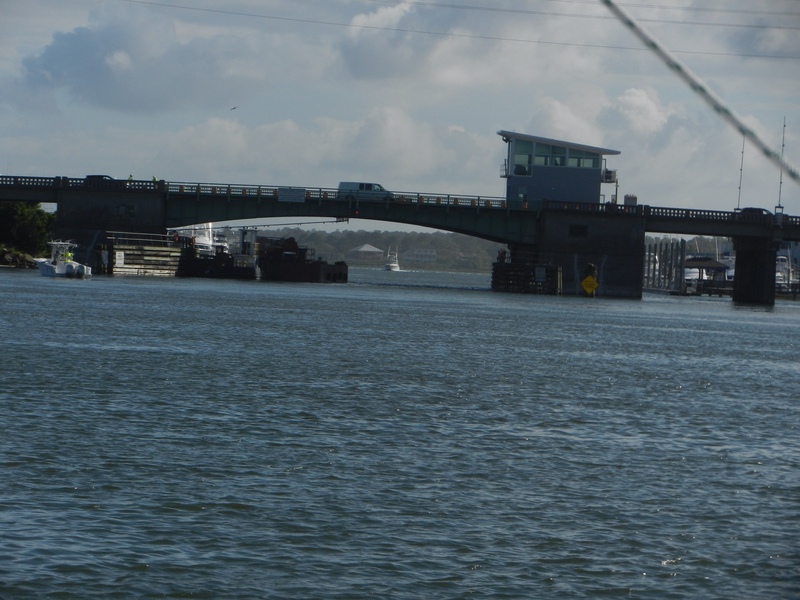 We passed under the Goose Bay Bridge. 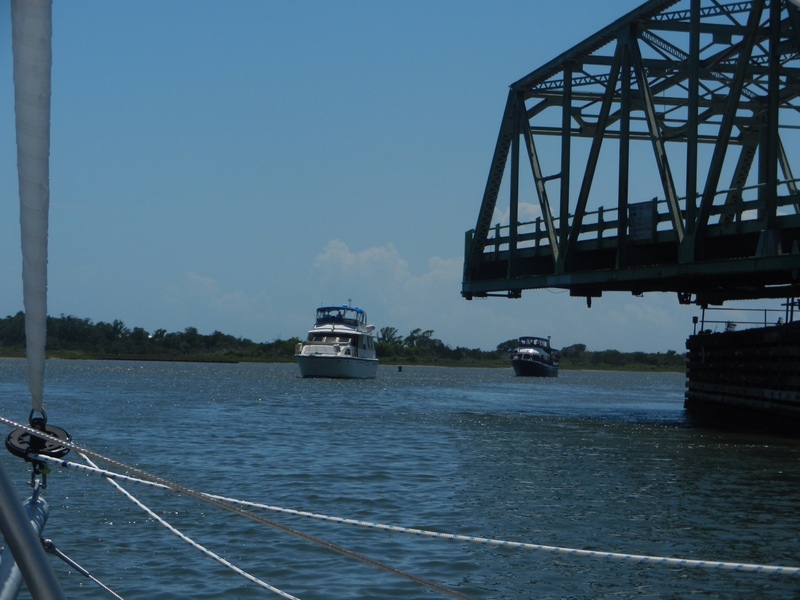 We picked up the pace with our engines hoping to make the 2 p.m. opening of the Surf City Bridge, another swing bridge. 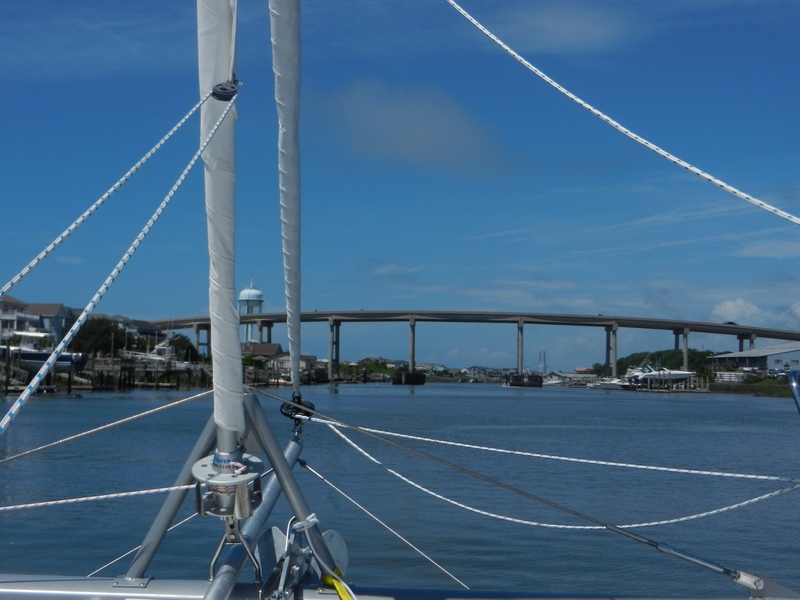 The last bridge was the Wrightsville Beach Bridge. It was a basculle bridge and we had to wait 45 minutes for it to open. 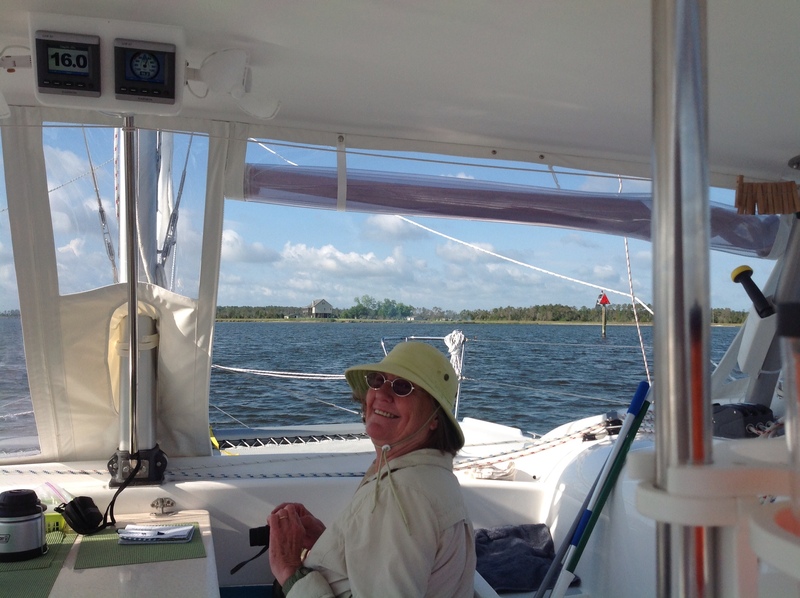 After that we pulled into our anchor spot there at Wrightville Beach. 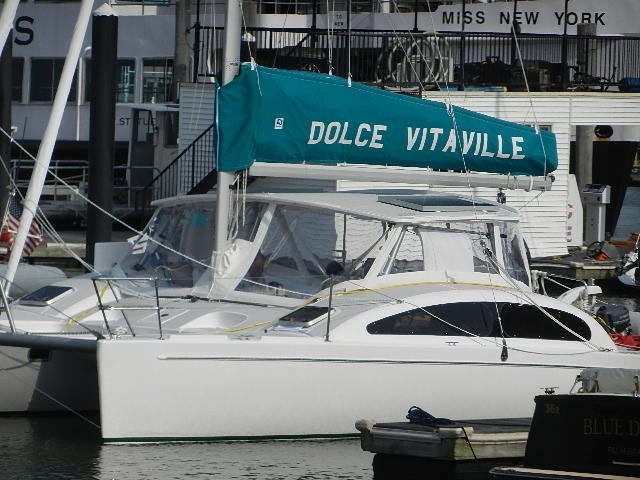 We saw lots of power boats, many of them yachts. Not so many sailboats. This was the opposite of our deserted anchorage near Belhaven. 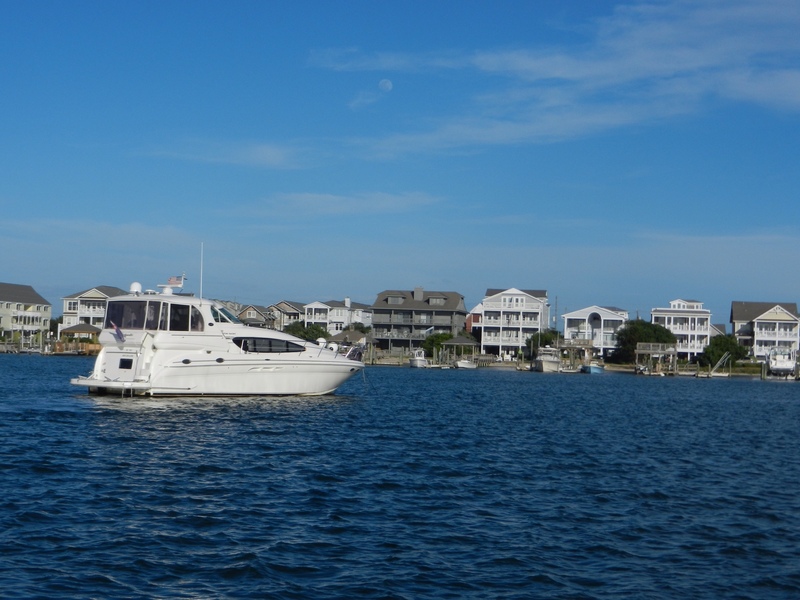 There were lots of other boats anchored there and we were surrounded by hotels, condominiums and beach houses. 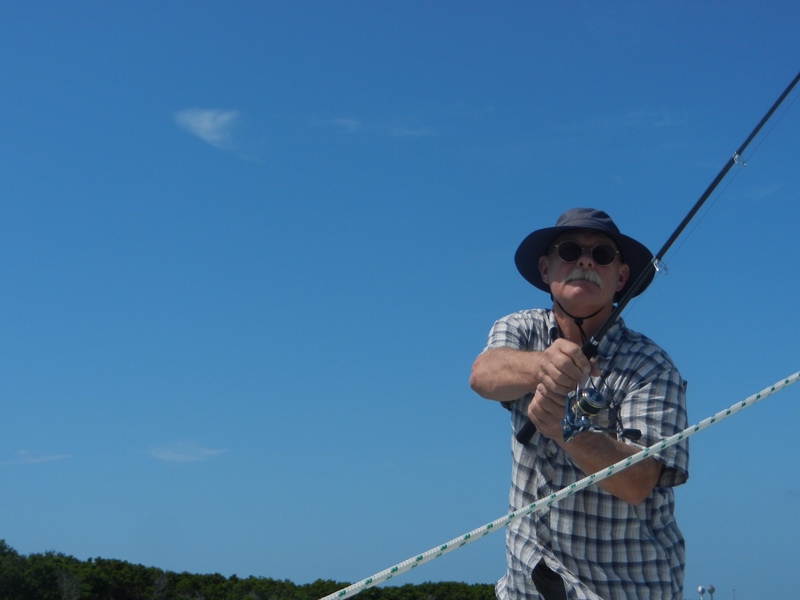 Stephen got Into the water to see if his fishing line had wrapped around the prop. All was okay. We had a delicious feast of leftovers…..ginger beef, fish, rice, avocados, tomatoes and whatever else was left from previous great meals. 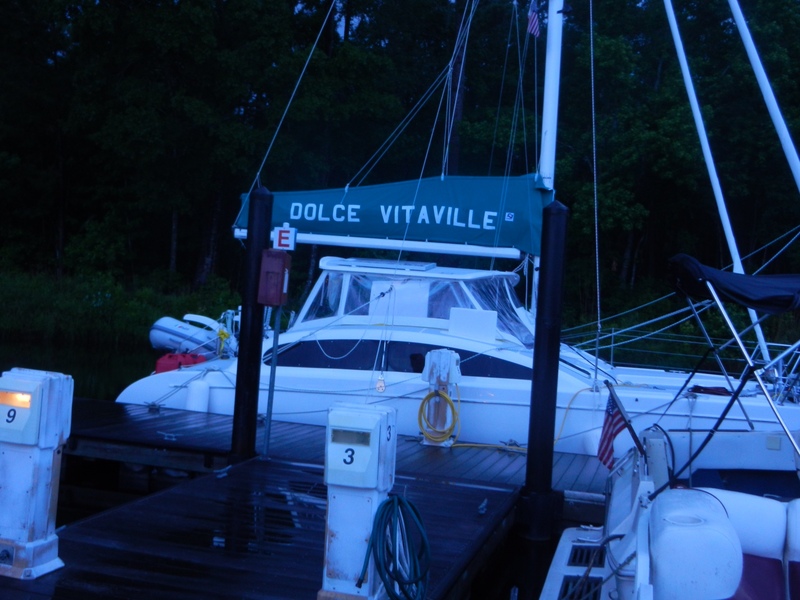 We had one small incident when the tide changed and the neighboring boat came awfully close to ours. 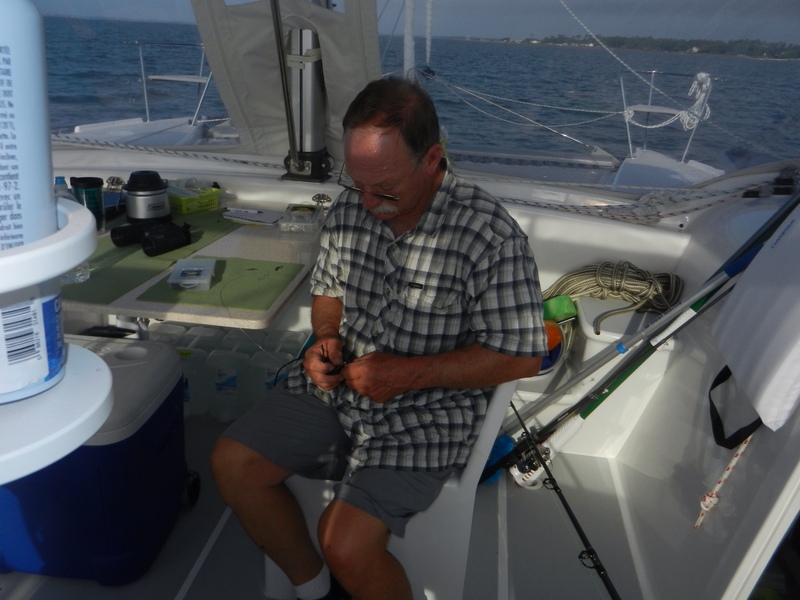 He had entirely too much anchor rode out for a small crowded anchorage such as it was. We kept an eye out for awhile. Eventually, we retired relaxed and satisfied with another successful day. 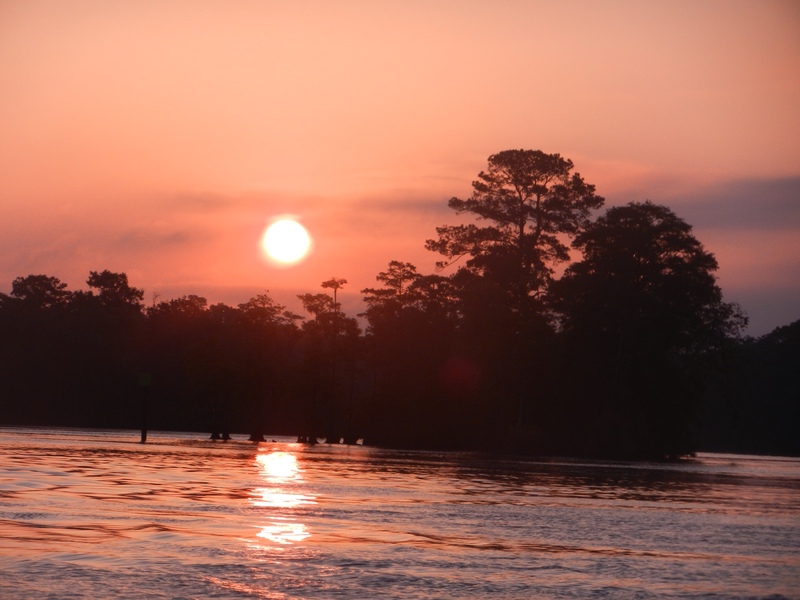 We left our anchorage in Belhaven at 5:30 a.m. 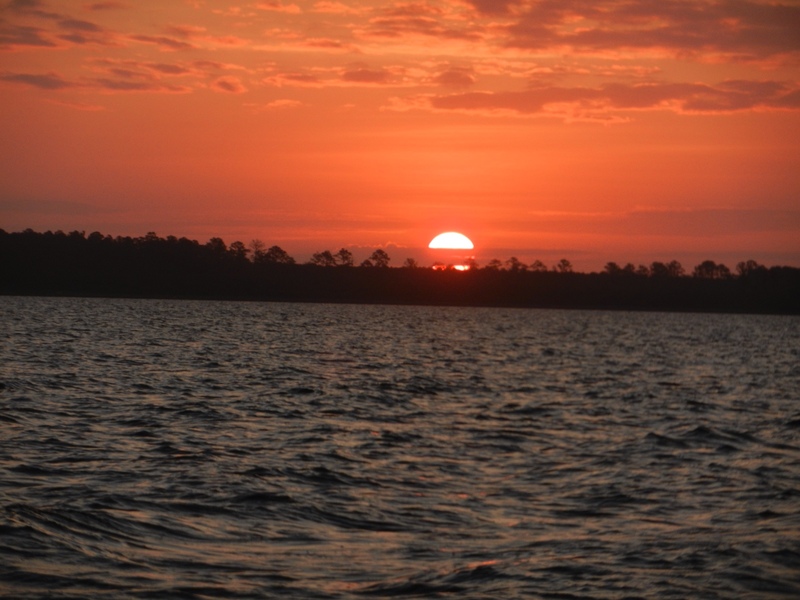 It was a beautiful sunrise. 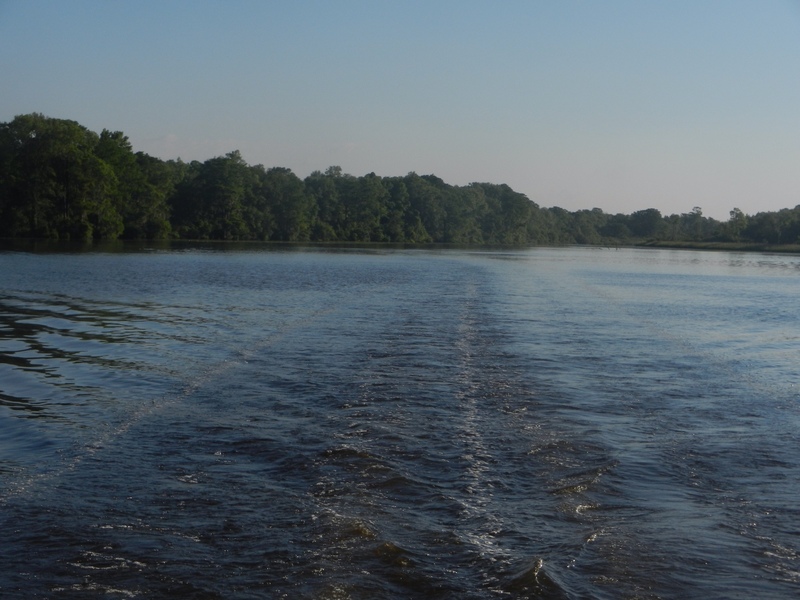 We traveled through the Pongo River into the Pamlico River and by 8 a.m. we were in Goose Creek. 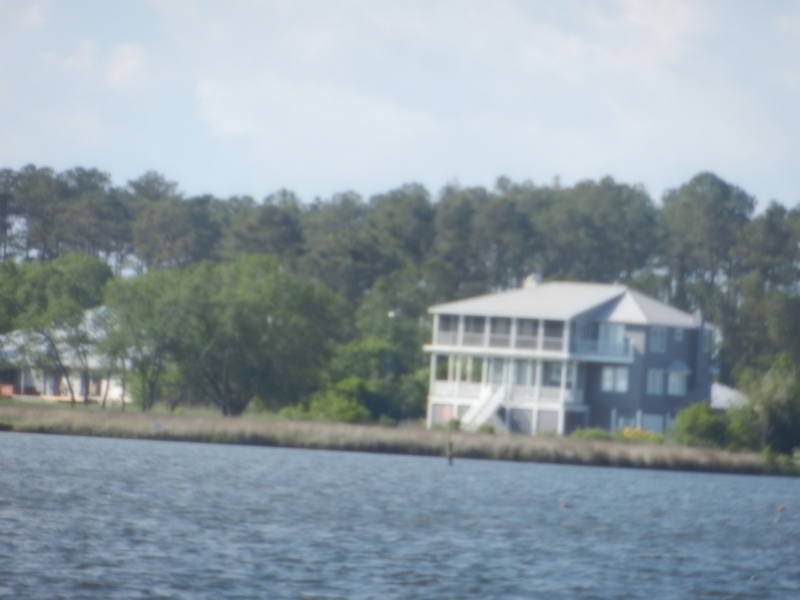 There were lovely homes along the creek. 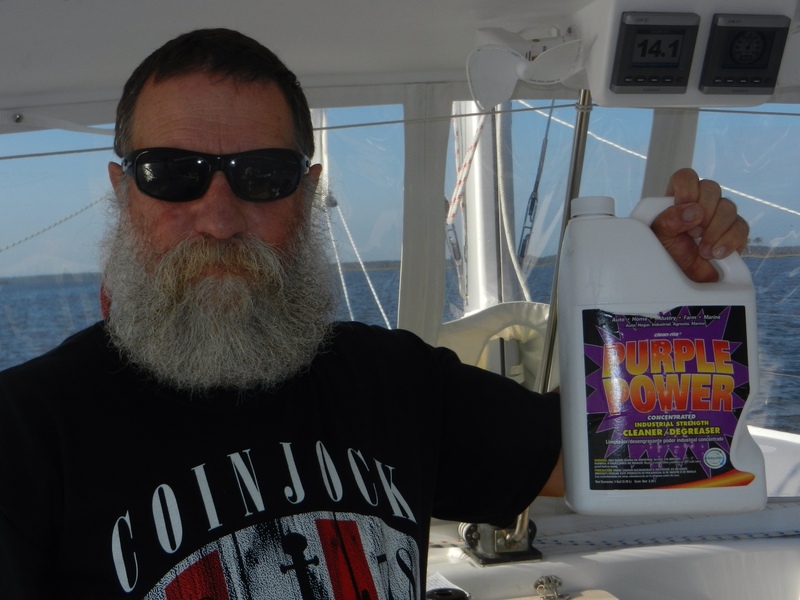 Ralph used vinegar and Purple Power to clean dead bugs off the ceiling. We had quite a mosquito invasion the night before. Arlene cleaned in the galley. 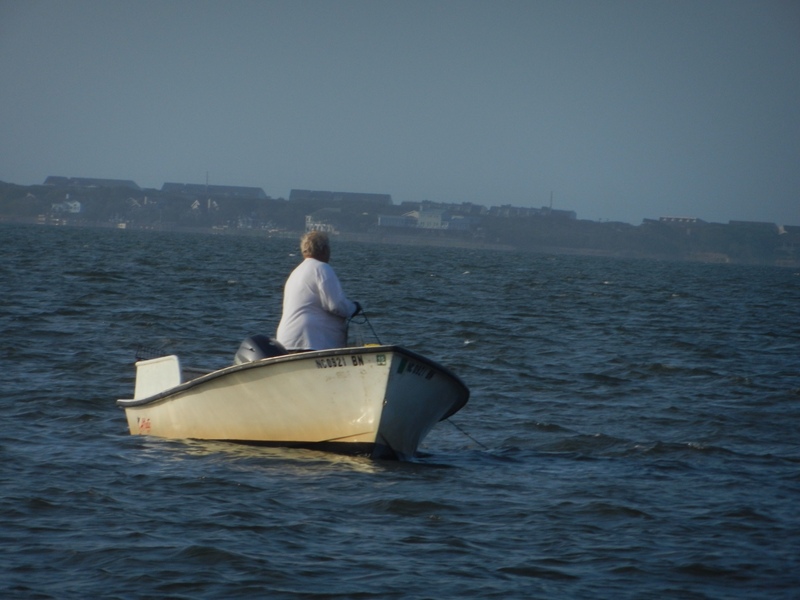 We saw a fisherman tending his pots. Around 8:30 a.m. Goose Creek narrowed into a canal. This canal connects Goose Creek and the Neuce River. 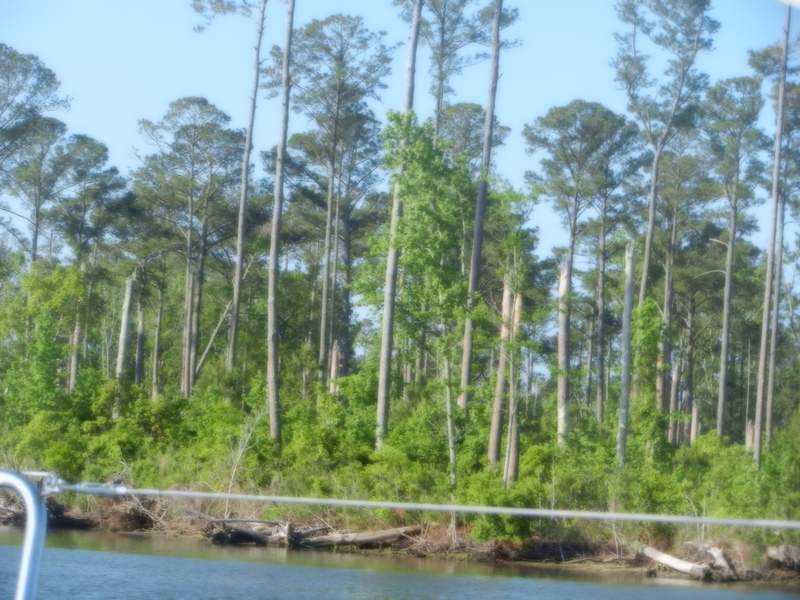 Along the way we saw damage to the trees along the banks, possibly caused by a hurricane. 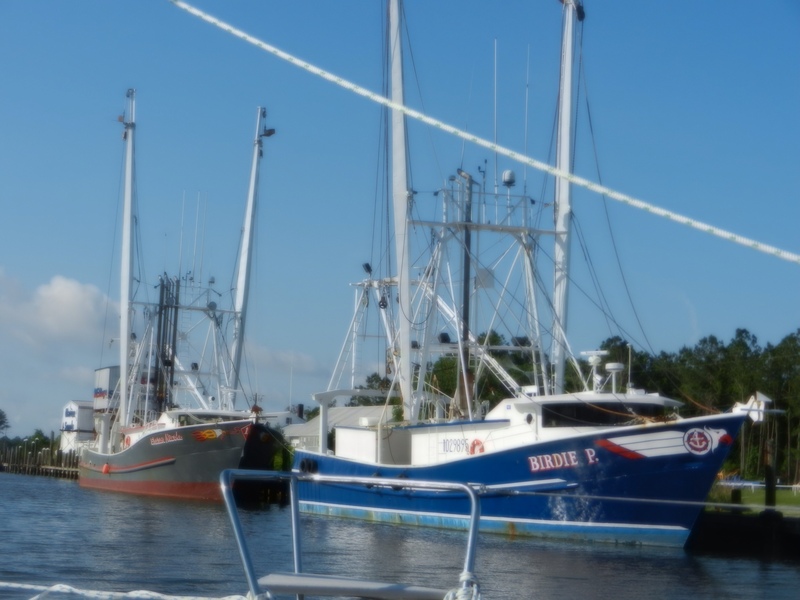 We passed a marina with several large fishing boats. Arlene tidies up the screecher line. 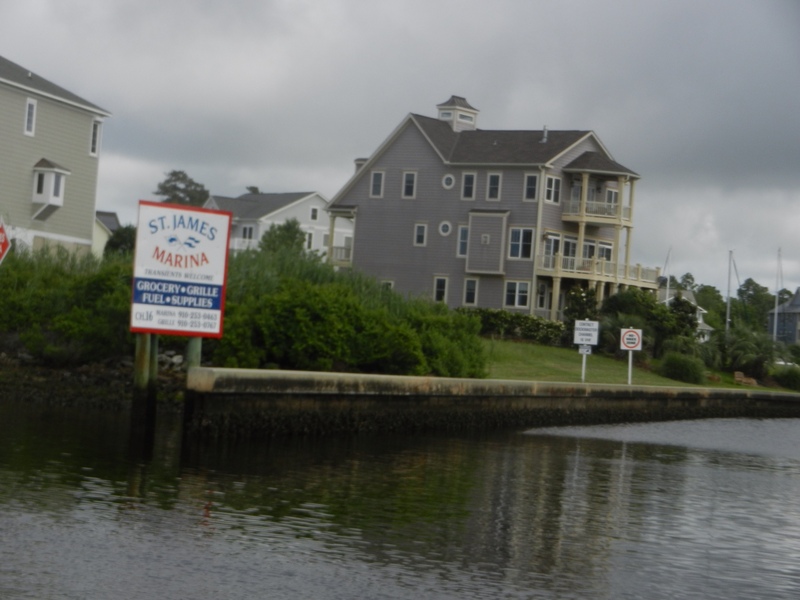 We would eventually see a few private homes along the canal. By 9 a.m. we left the canal and entered the Neuce River. Our plan was to travel about 65 miles that day. 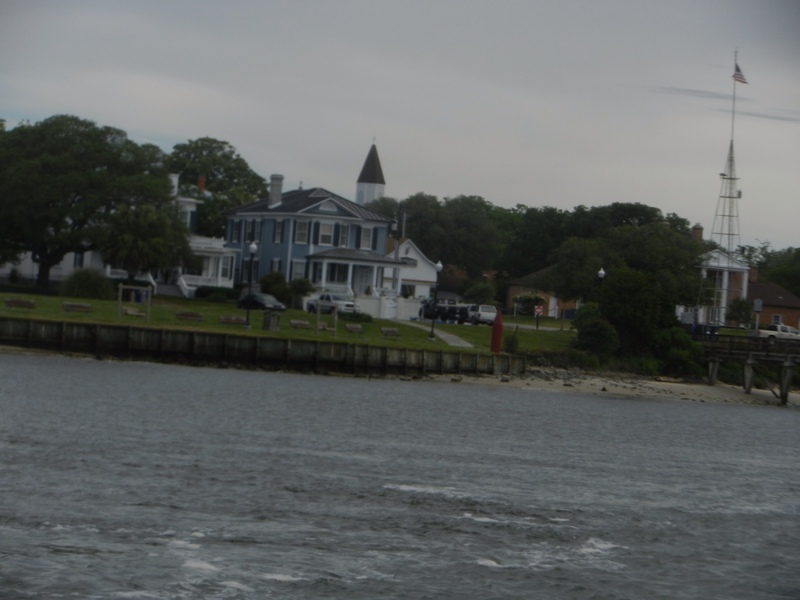 Our destination was Morehead City, close to Beaufort, NC. Beaufort, by the way, is pronounced Bo fort just like Beaumont. 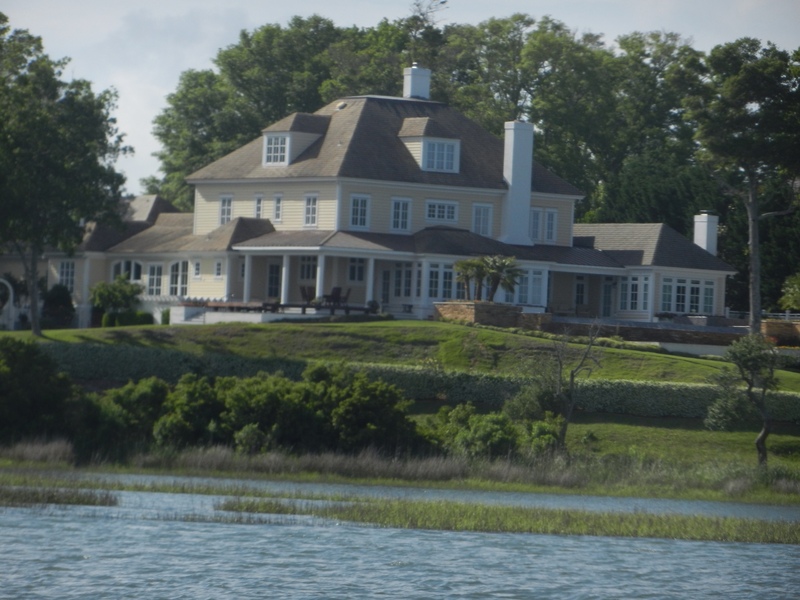 In South Carolina there is a Beaufort pronounced Bu fort. Go figure. We pass a green square with a gold triangle on it. That means it's really red so leave it to the starboard side. 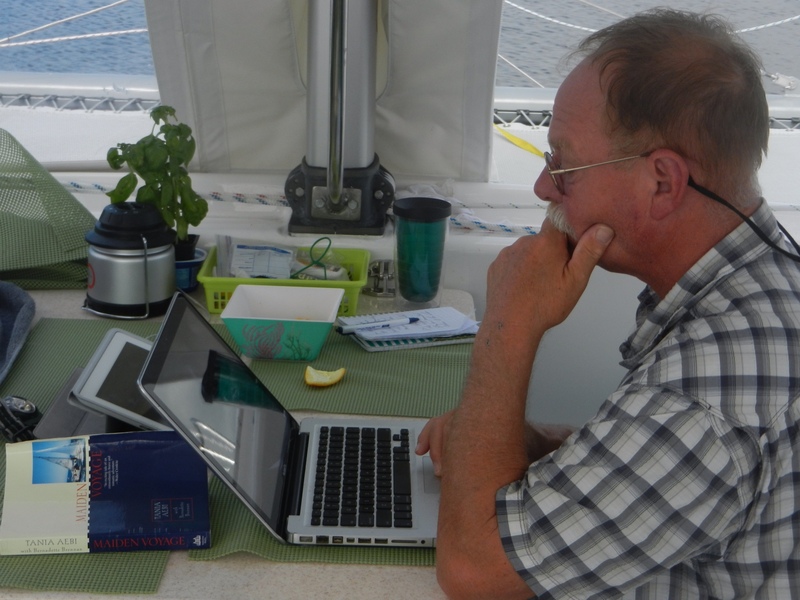 There's much to learn about navigating the I C W.
Stephen was at the helm for several hours. At 10 a.m. Capt. 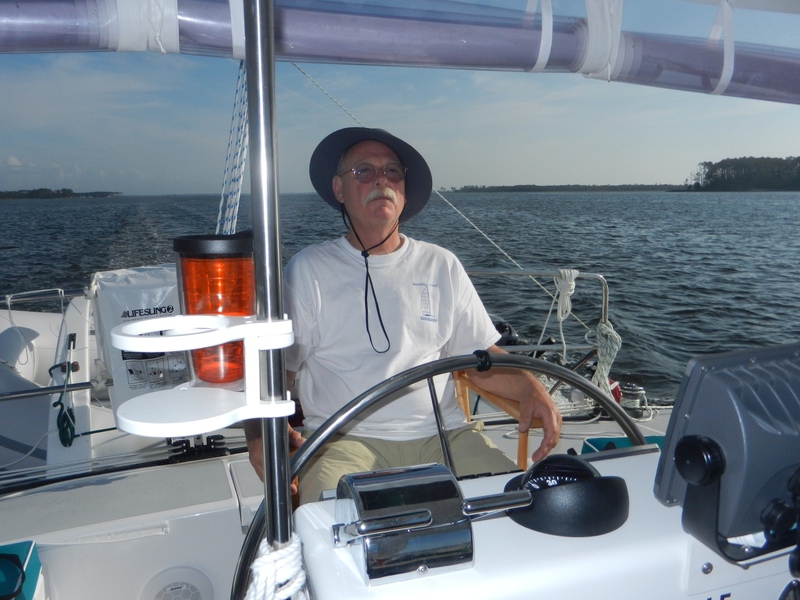 Ralph took the helm again. 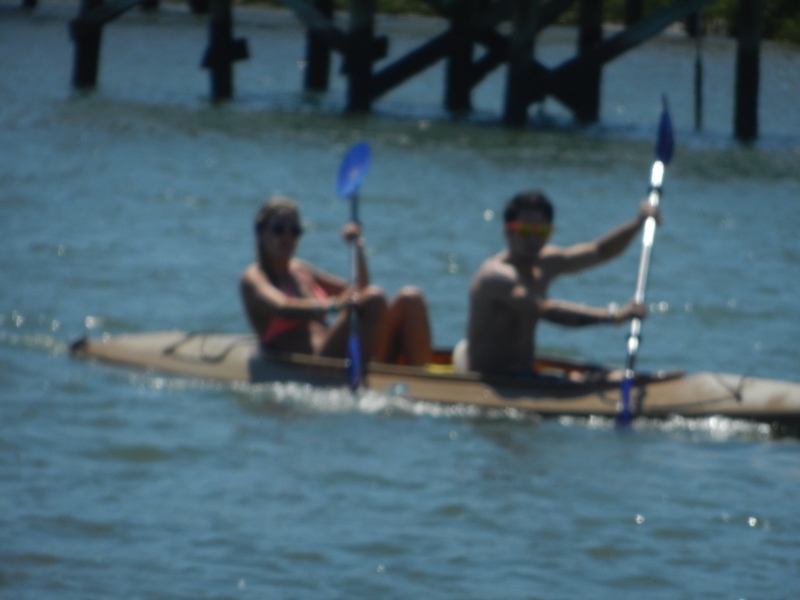 We would be on the Neuce River for several hours. It's a large body of water, once again almost like a bay. 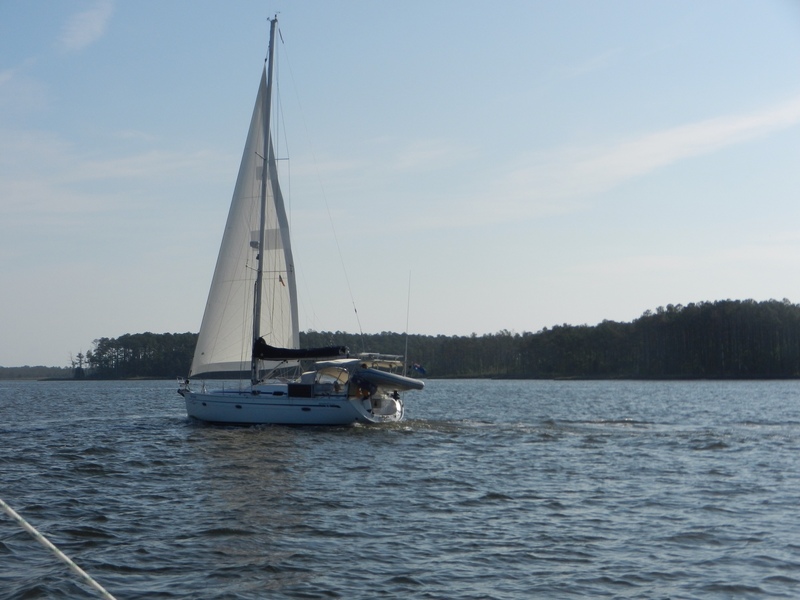 Eventually we would go south down Adams Creek to a large bay where Beaufort and Morehead City are located. 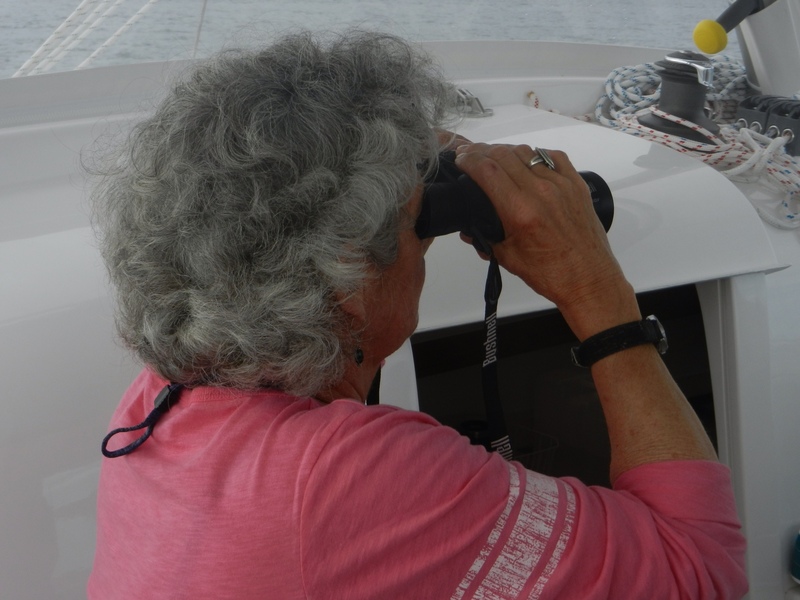 We saw many sailboats sailing north. 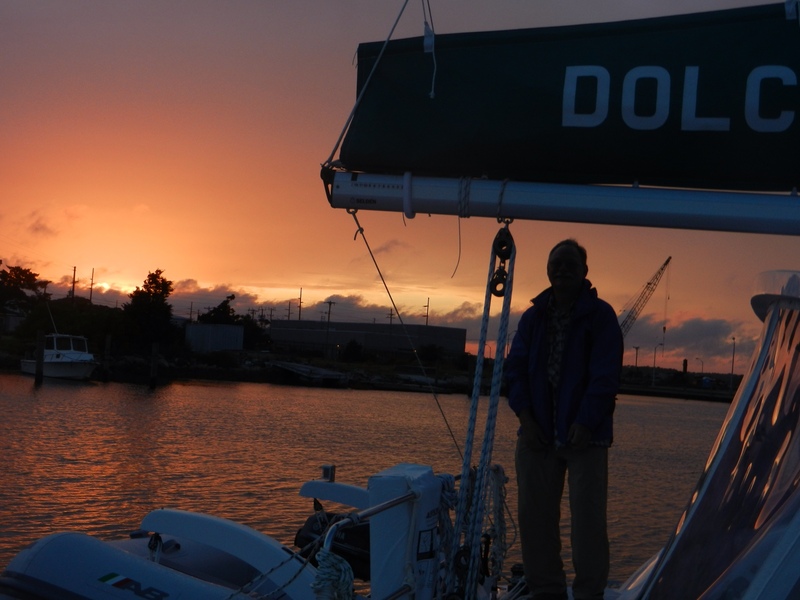 We wished we could be sailing too, but, alas we were still heading straight into the wind. That's pretty much the way it is this time if year. 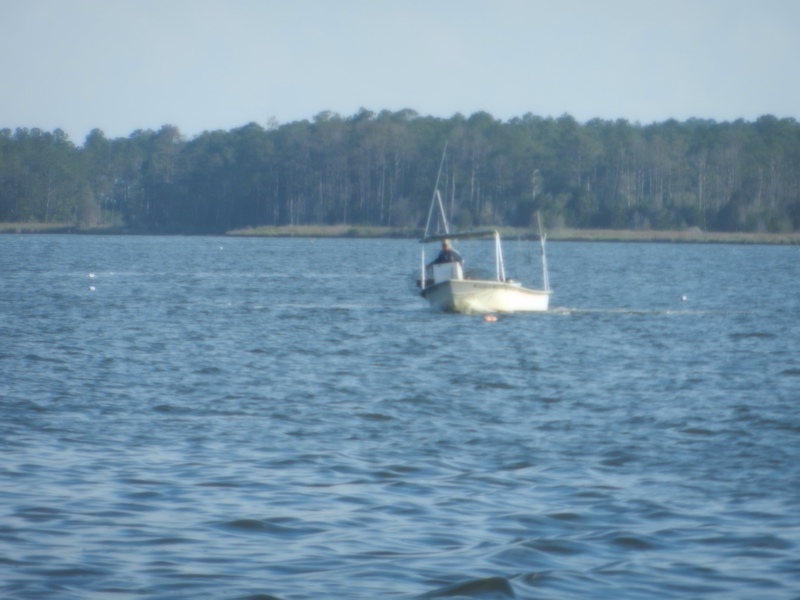 Many folks from the north have taken their boats to Florida or the Bahamas for the winter. 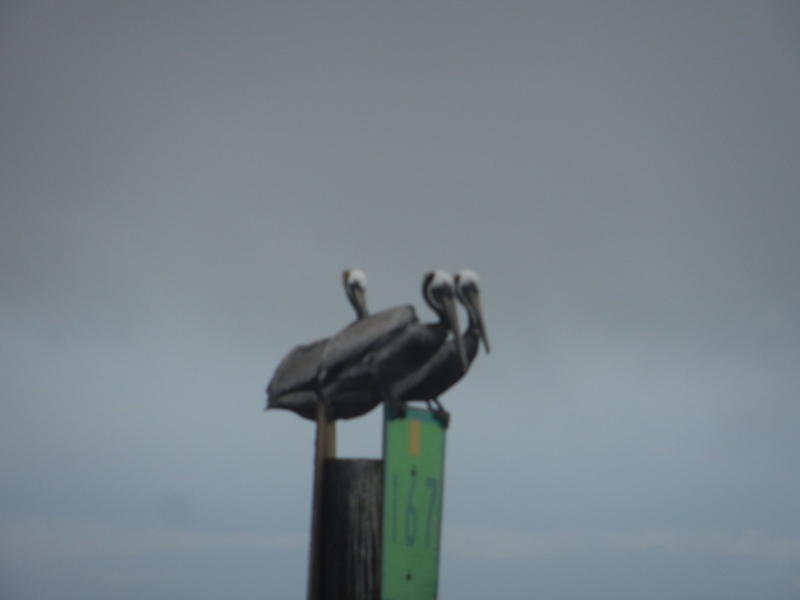 This is the perfect time of year for them to travel back to their home ports in the northeast and Canada. 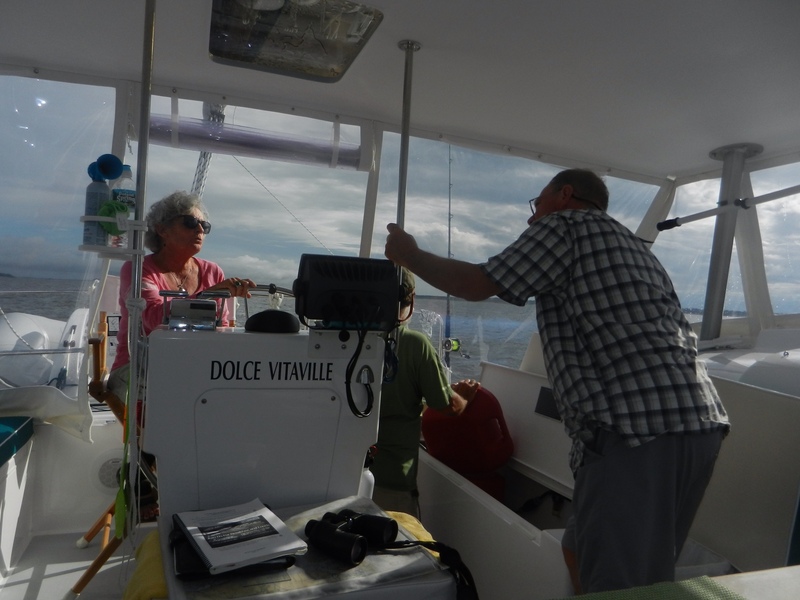 At 11:30 Arlene takes over the helm. Th helm is a very sunny spot today. It's a gorgeous, sunny day. We had grilled ham and cheese sandwiches for lunch. 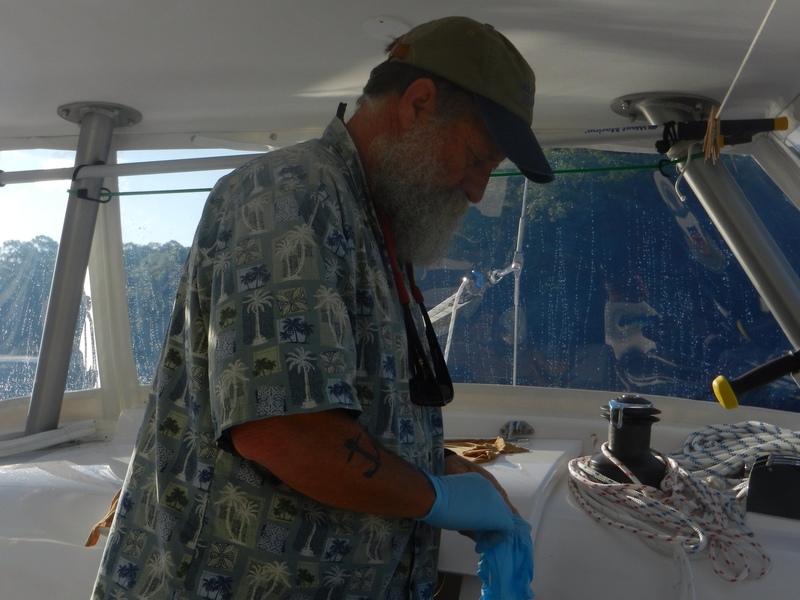 Here's Stephen cleaning up the galley. 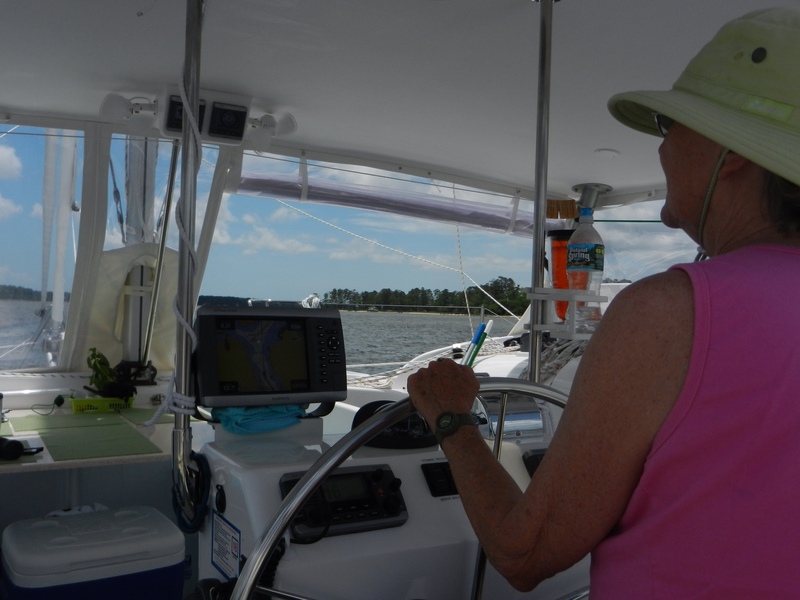 After lunch Franci moved into the helm position and got to take the boat through Adams Creek. There were many homes along the way. It was a very scenic journey through Adams Creek. 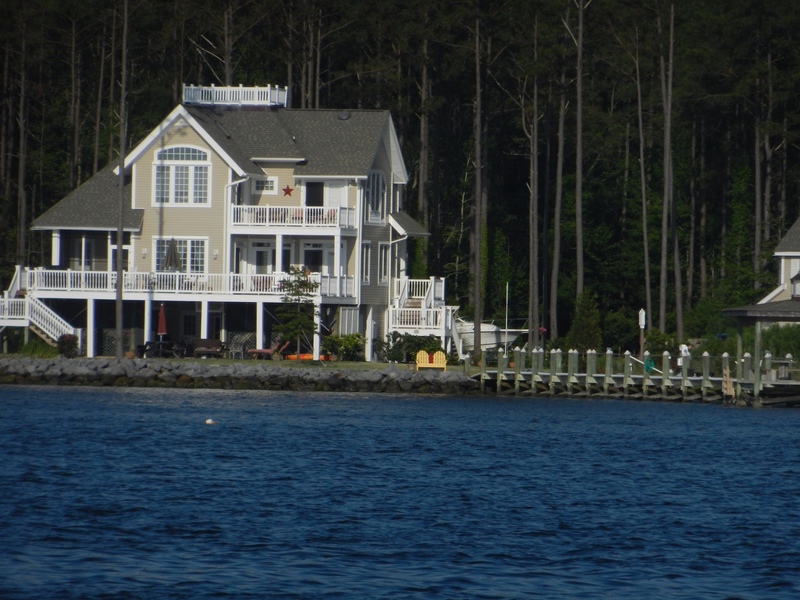 Nearly all the homes had private docks. 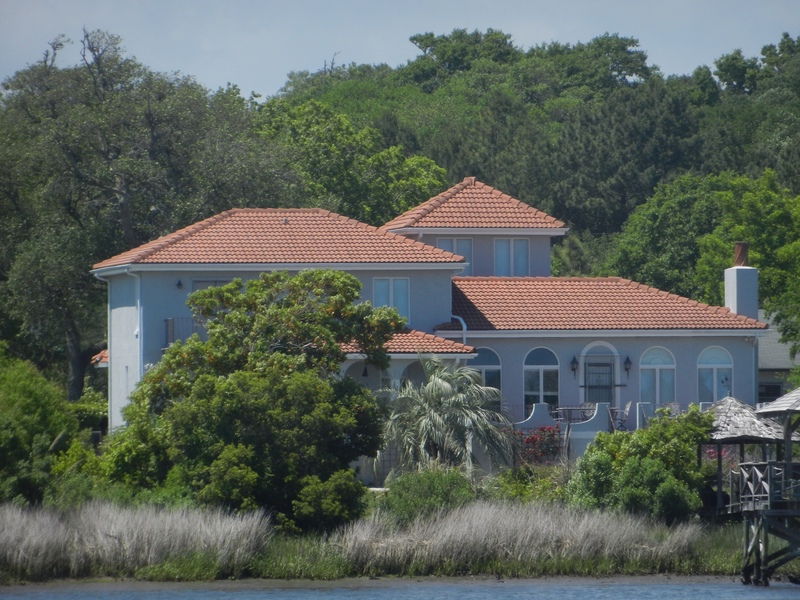 Many were vacation homes. 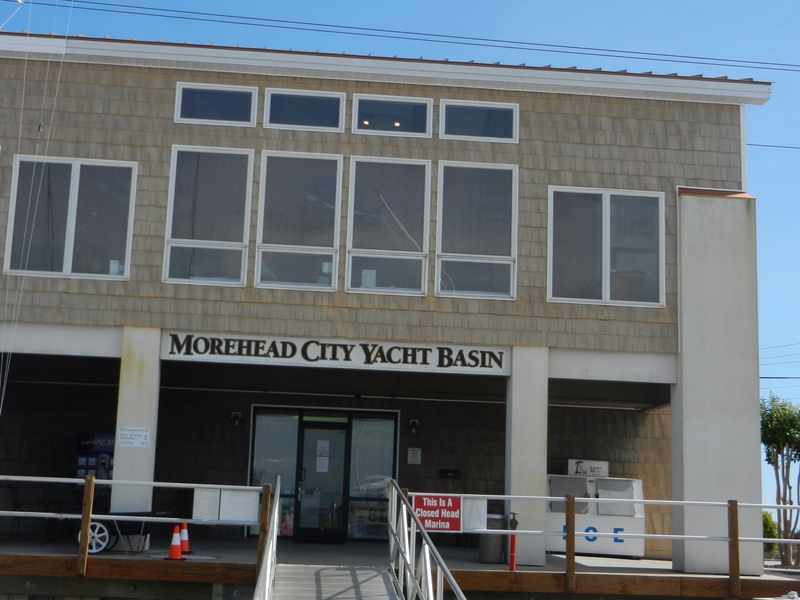 At 3 o'clock we arrived at our destination, Morehead City Yacht Basin. The part needed to repair the front beam was there and Ralph and Stephen started immediately working on that repair. 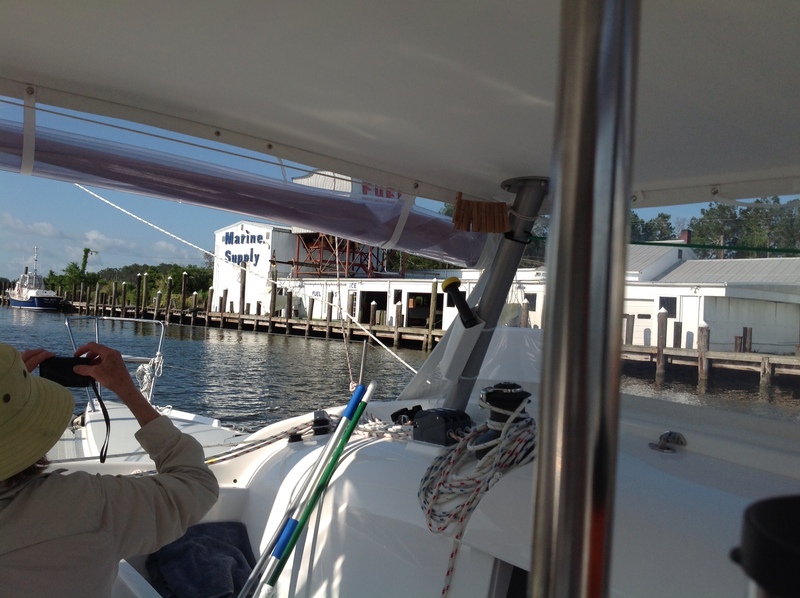 Meanwhiie Franci and Alene took the courtesy car to West Marine, the grocery store and the liquor store. 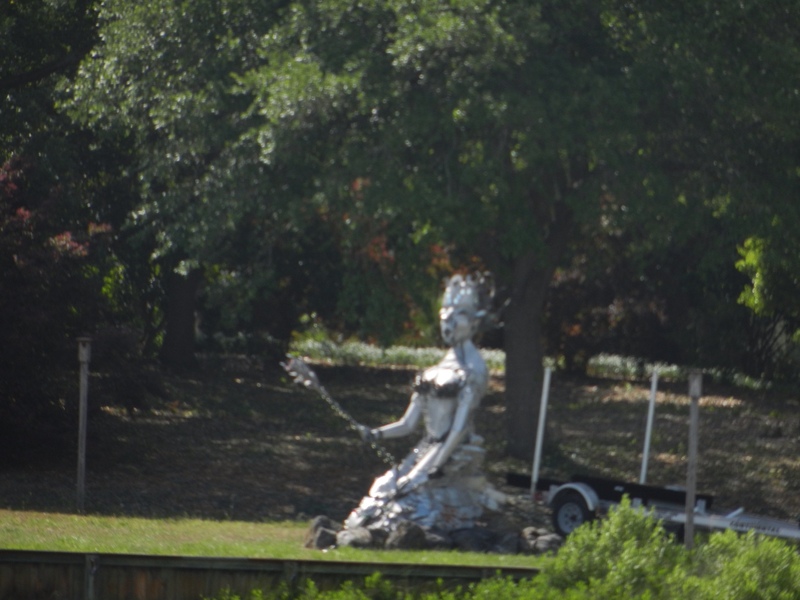 They also got more ice from the marina. At West Marine a gentlemen named Steve helped them buy Stephen a trolling rod and reel and all that he will need to catch a fish along our way. He's very excited about trying to catch a fish. 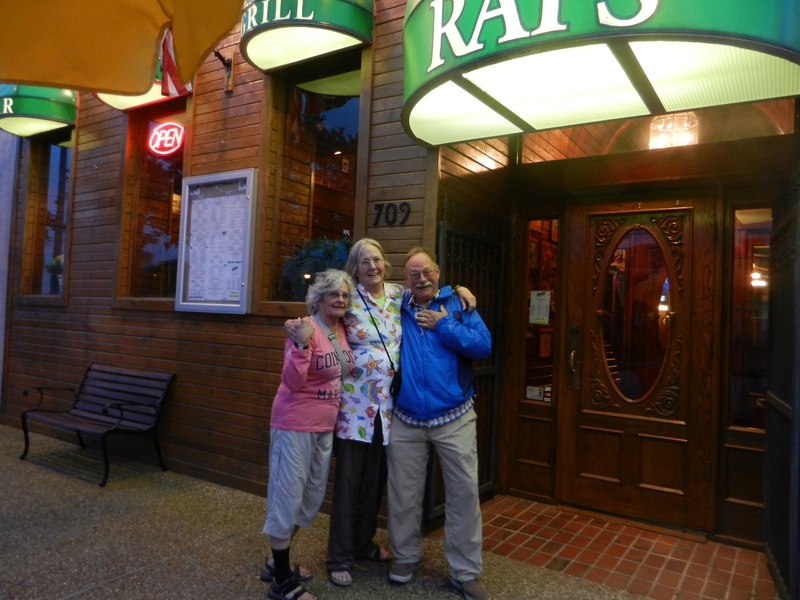 After showers for all, we walked down to Raps, a charming little pub where we had drinks and dinner. 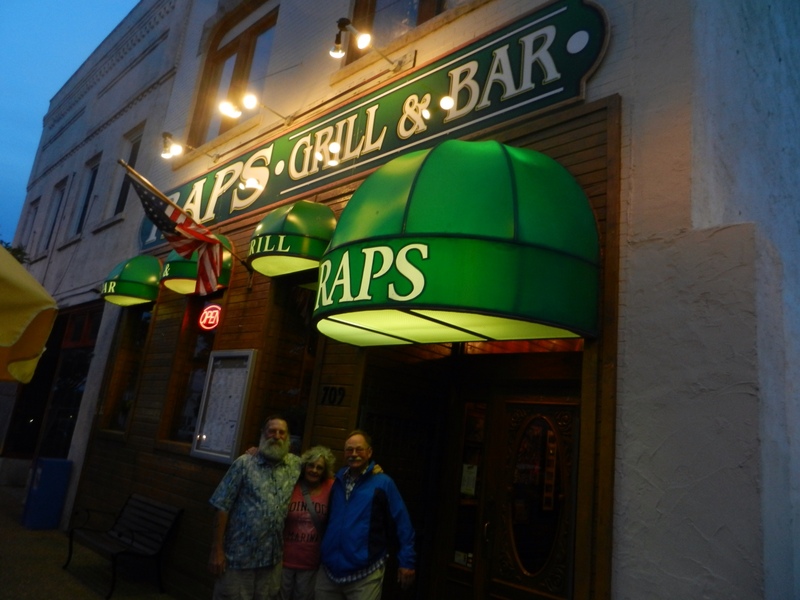 We thoroughly enjoyed meeting the waitress, bartender, cook and management. It was a very fun way to spend our evening. Ralph knows all the good spots.